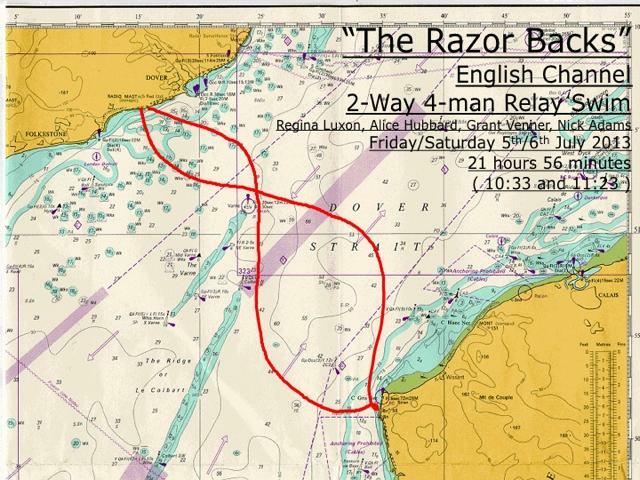 You need a lot of planets to align to get a channel relay away successfully, and doubly so for a two-way relay. 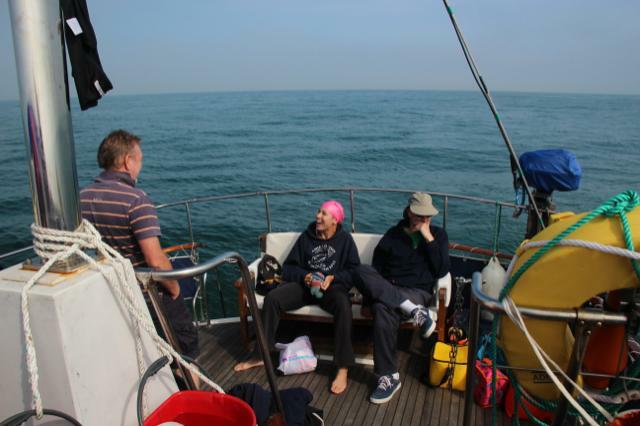 Back in September 2012, the Tri-Nation Razorbacks comprised two Aussies, one Brit and a Finn. 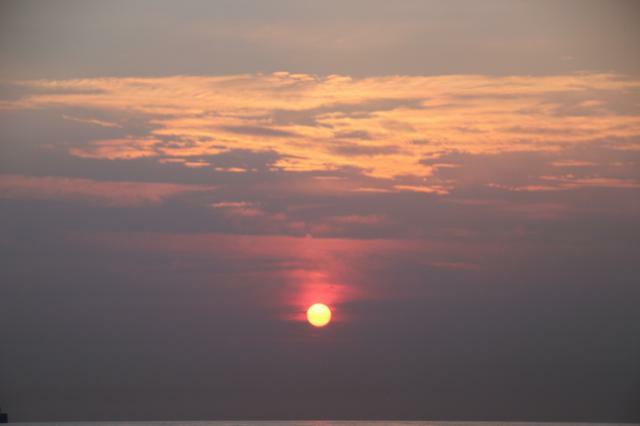 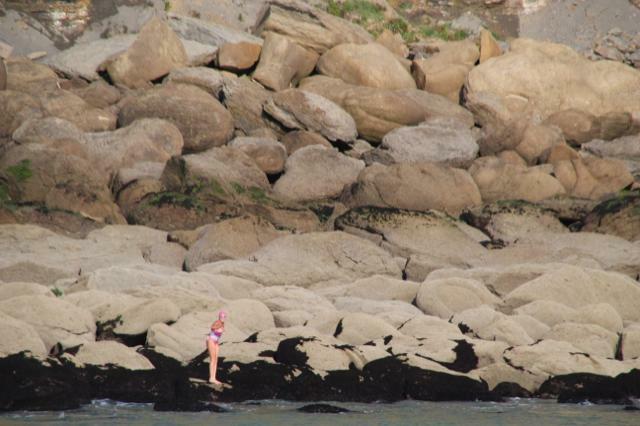 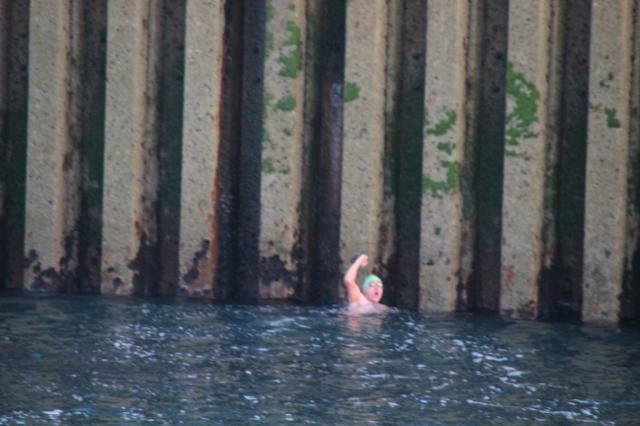 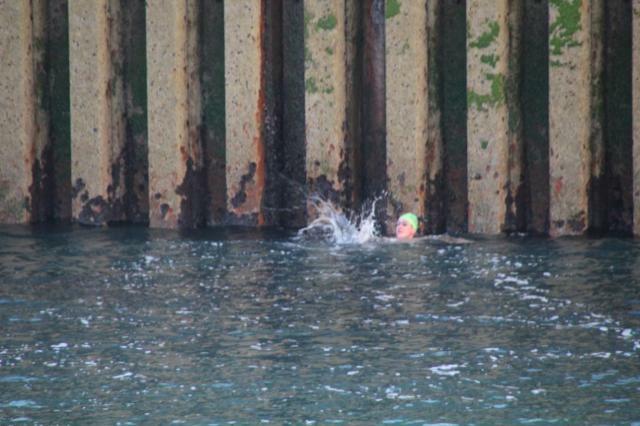 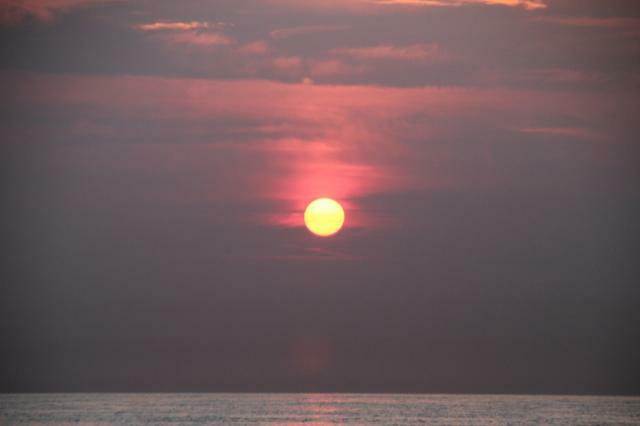 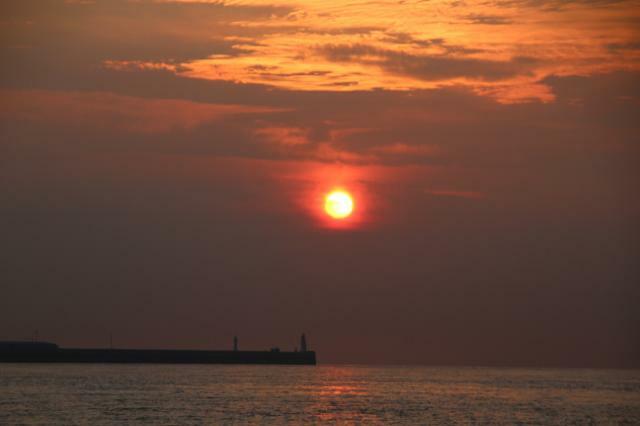 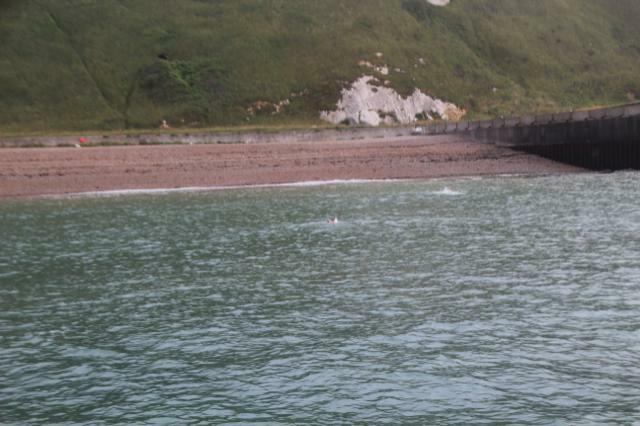 Poor late-season weather meant the swim could not go ahead as planned, so it was rearranged for the first week of July 2013. 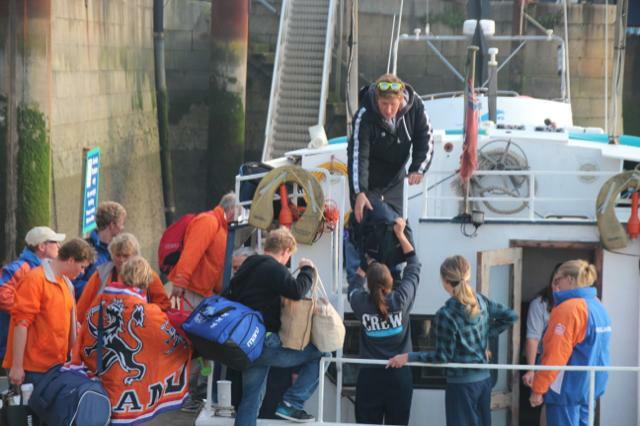 By this time, other commitments and injury had changed the make-up of the team to three Brits and one Australian, forcing a quick re-brand to ‘The Razorbacks’. 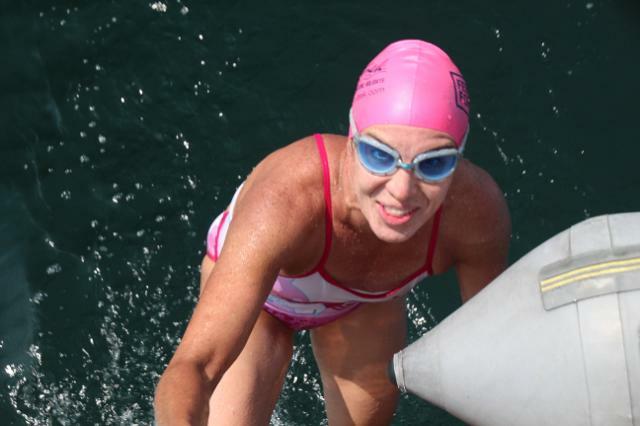 The relay was the brainchild of Regina Luxon, inspired both by two successful one-way relays with Aspire boats, and by her own solo swim preparations. 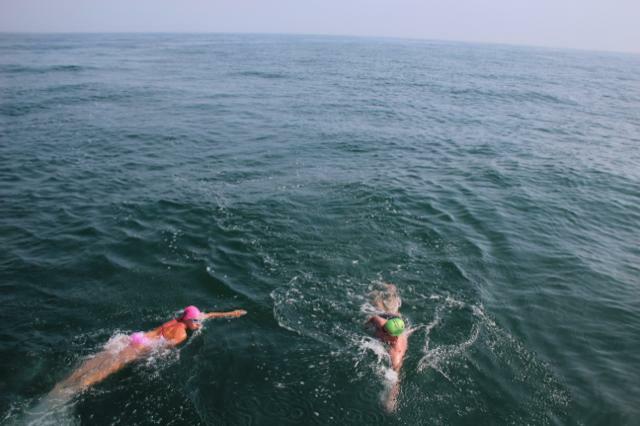 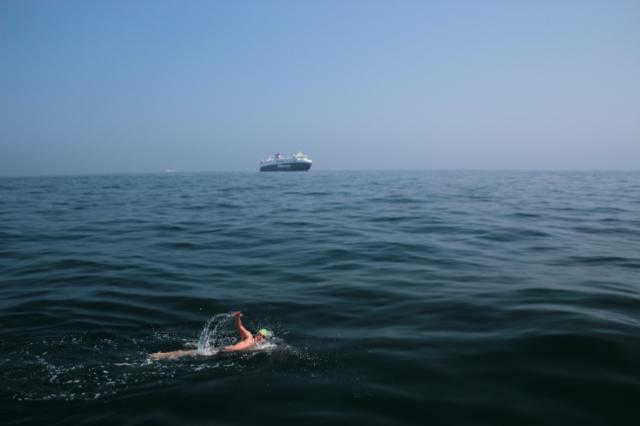 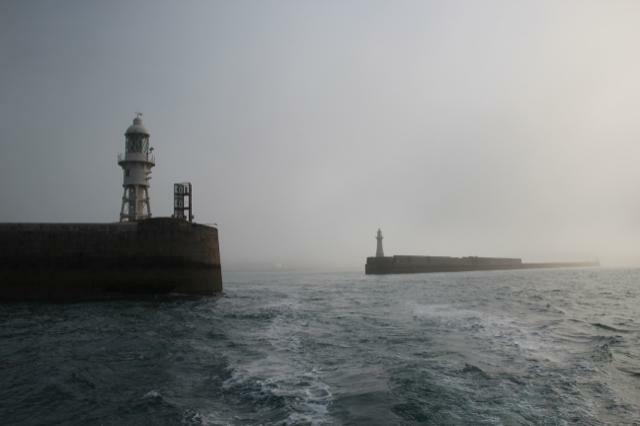 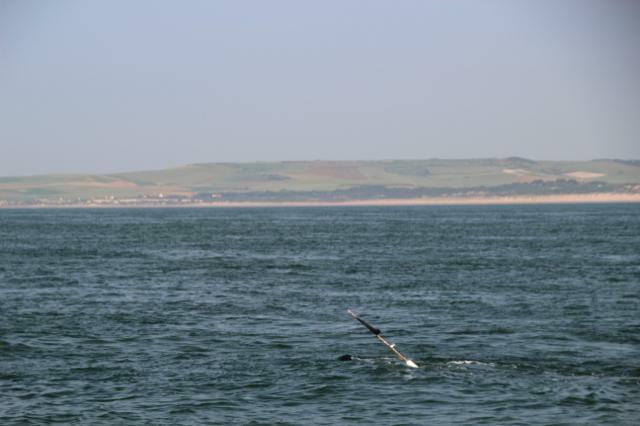 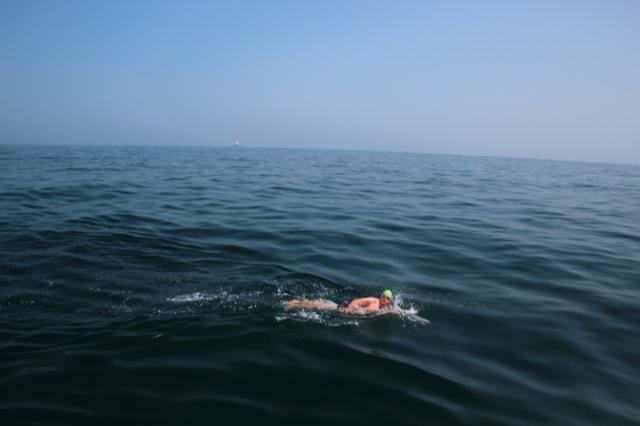 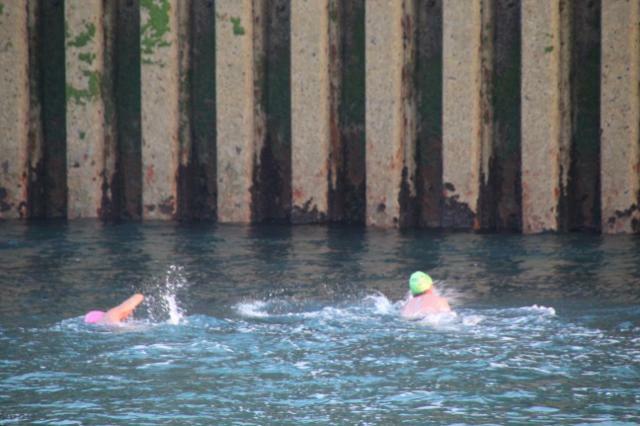 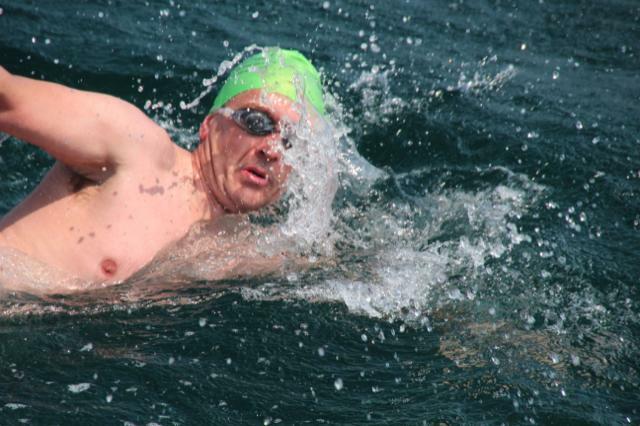 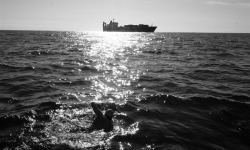 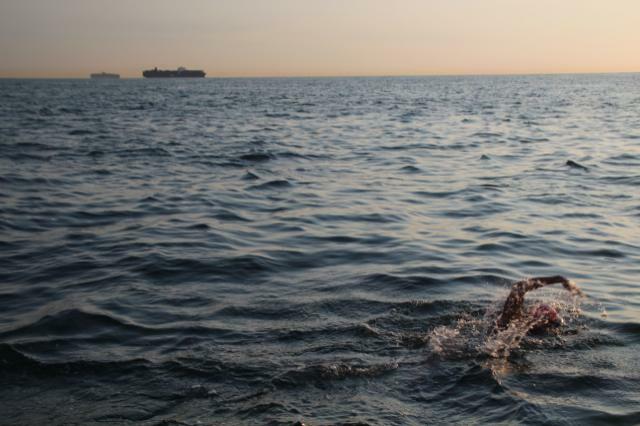 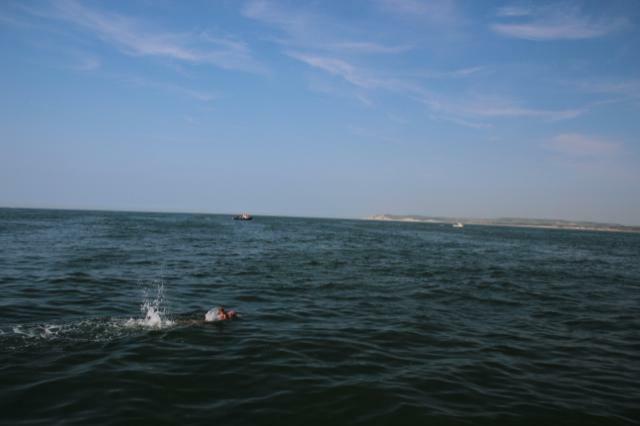 A two-way with a team of four would mean that each swimmer would cover a distance equivalent to half of the channel in an envisaged 24-hour period – a significant challenge even for the most seasoned open water swimmers. 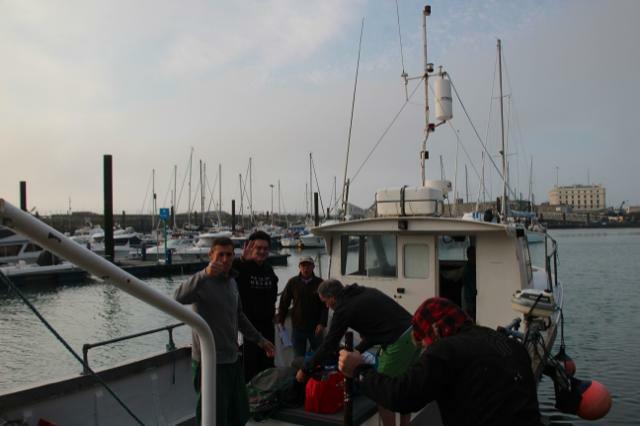 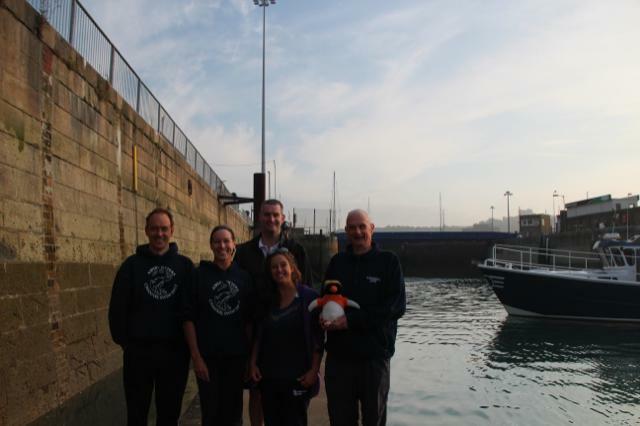 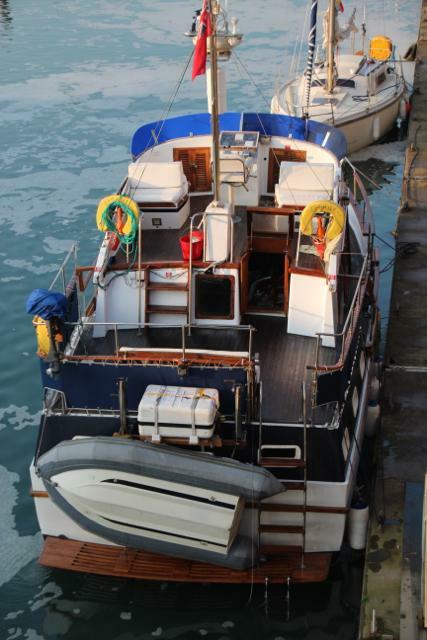 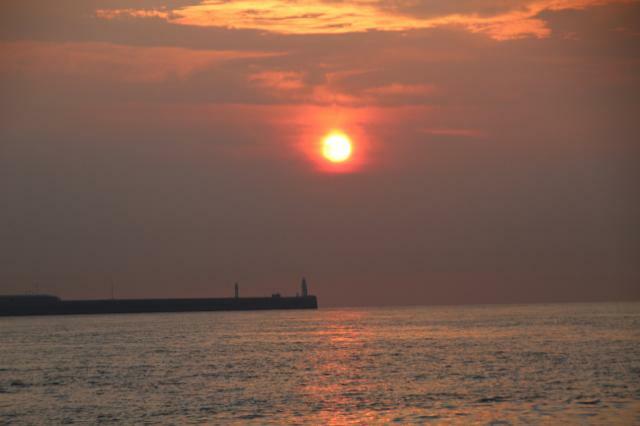 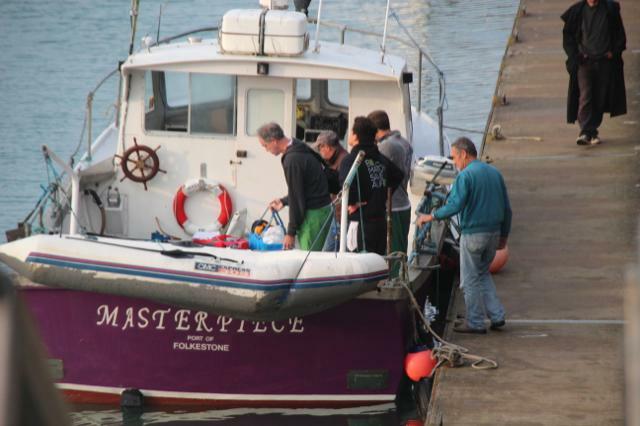 After a last-minute cancellation on the preceding Monday, the team assembled at Dover Marina early on the morning of Friday 5th July. 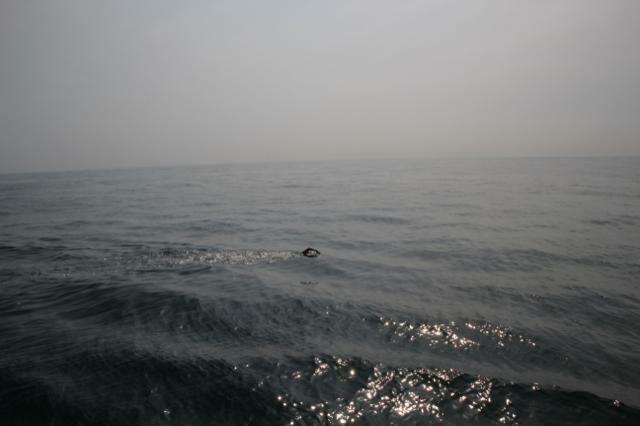 The weather gods were finally on our side; the sea was calm and the forecast clear. 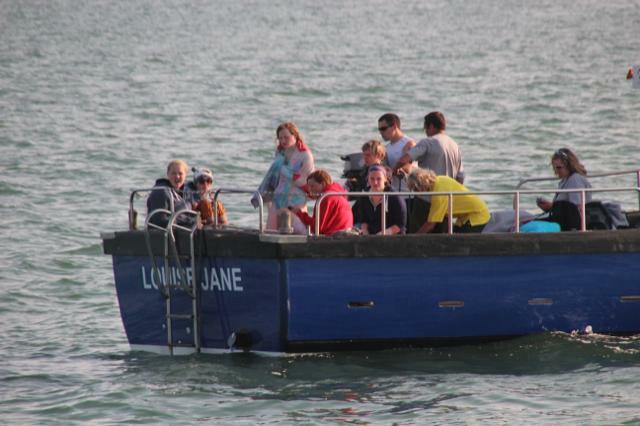 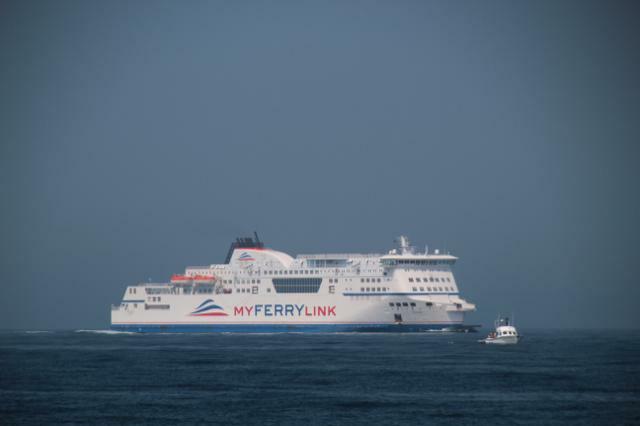 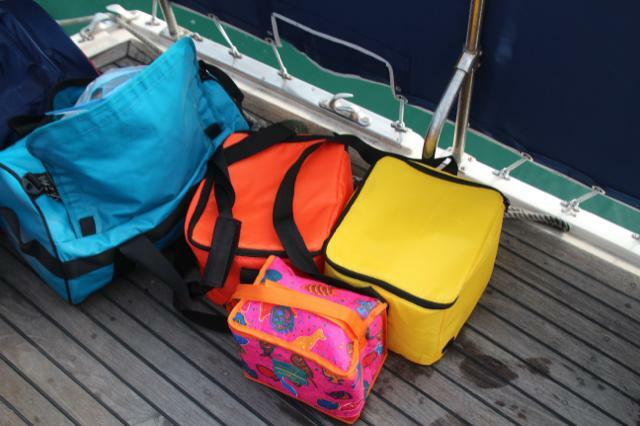 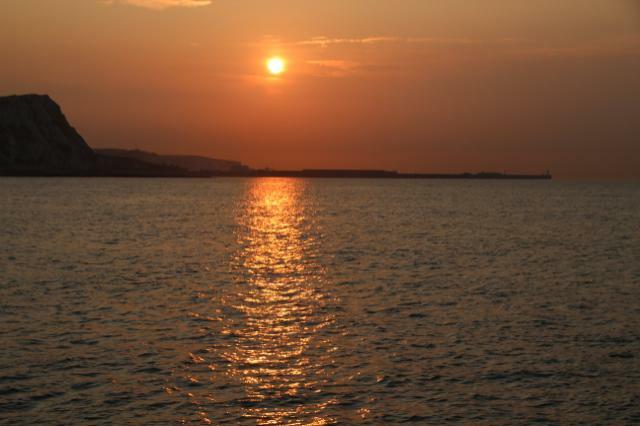 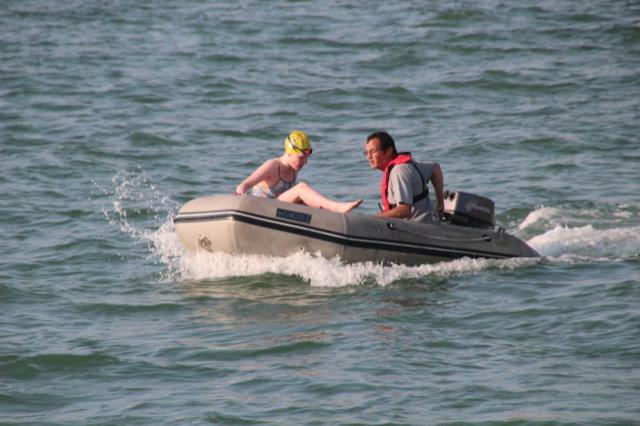 This would mean good swimming conditions and most importantly no problems with sea sickness. 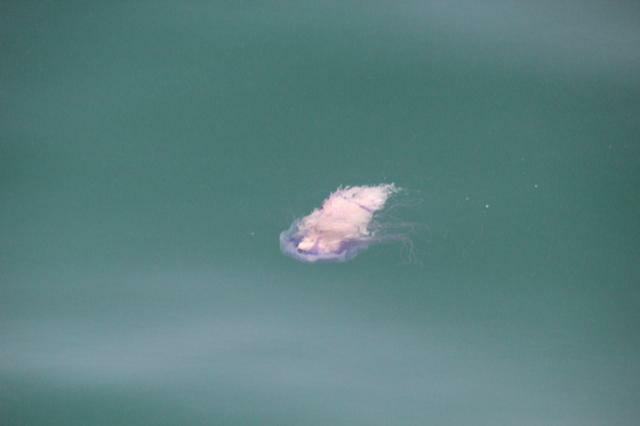 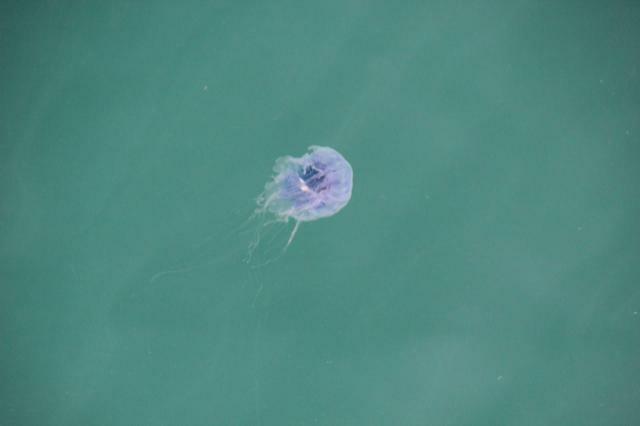 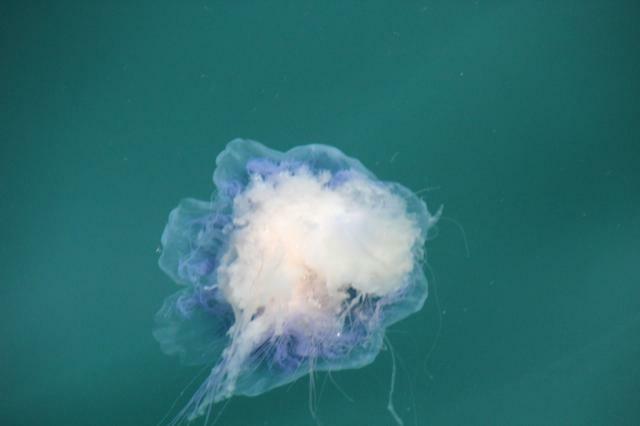 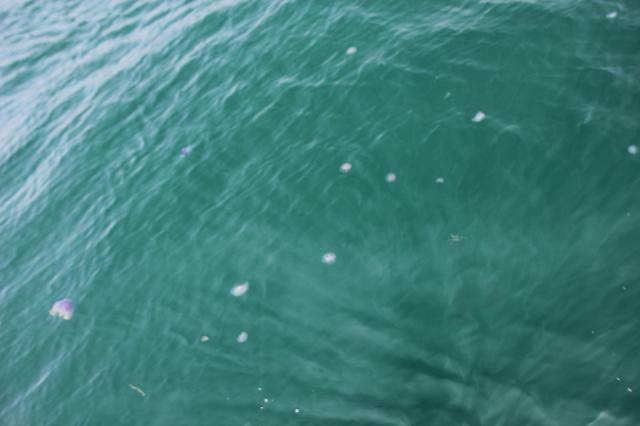 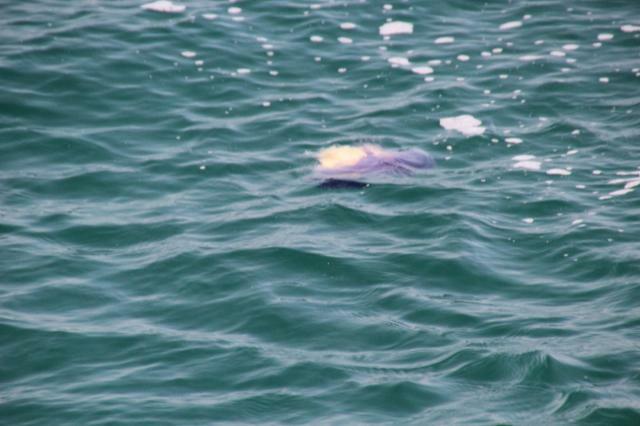 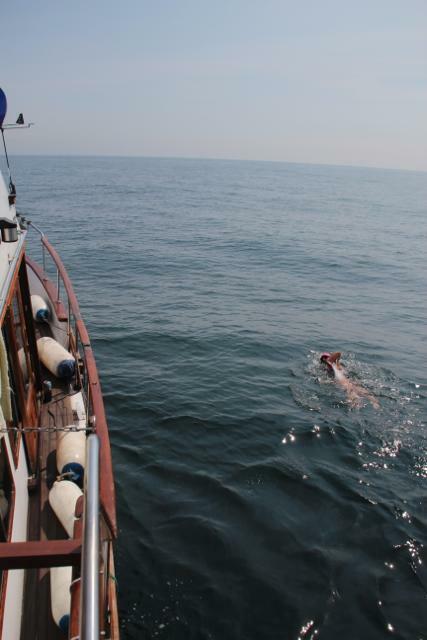 Nevertheless the channel was not letting us off that easily, with unseasonably cold water around 13-14 degrees and, as we would later find out, a spectacular jellyfish bloom mid-way through. 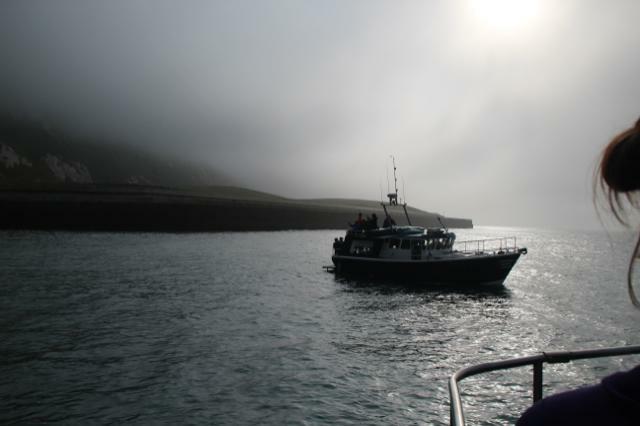 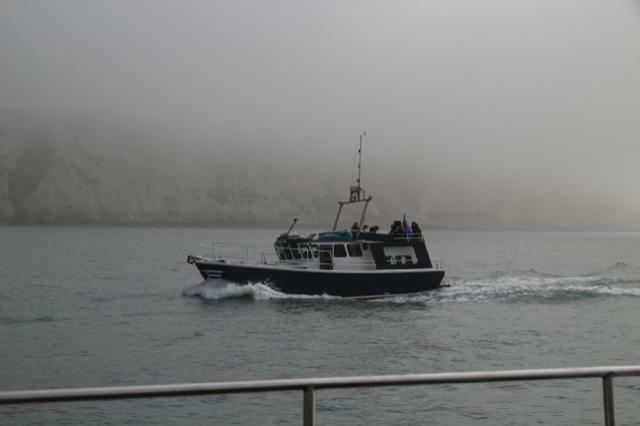 Against a backdrop of mist-covered cliffs, Nick Adams led us off from Samphire Hoe at 7.46am, to be followed by Grant Venner, Regina, and Alice Hubbard. 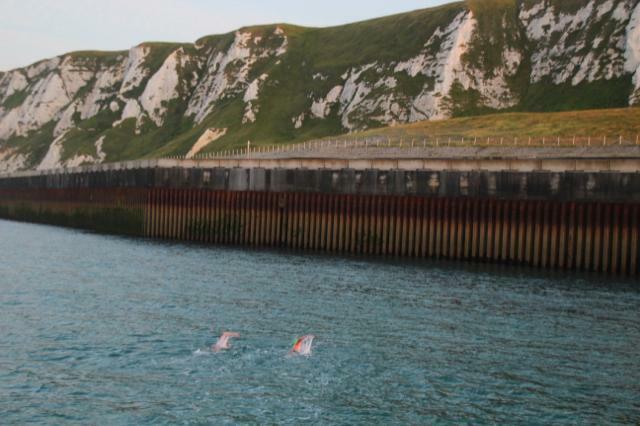 Next to us, dauntingly, was a 6-man team of elite swimmers from the Dutch national squad, making an attempt on the world record for a two-way crossing. 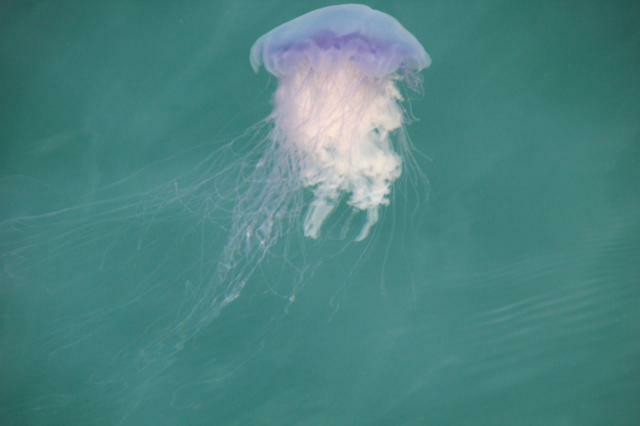 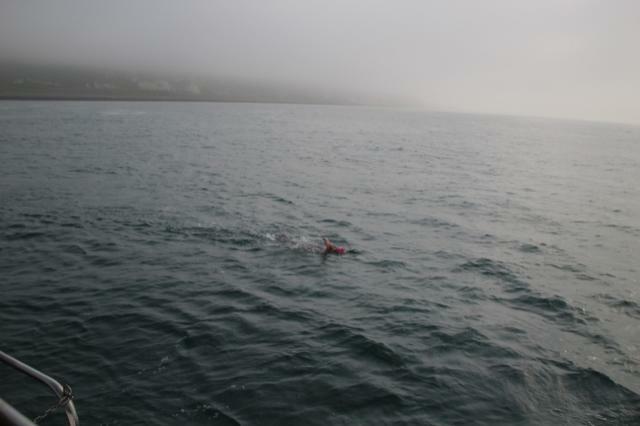 We settled into a good rhythm, and as the mist cleared and the sun broke through it made for some very enjoyable swimming, jellyfish notwithstanding. 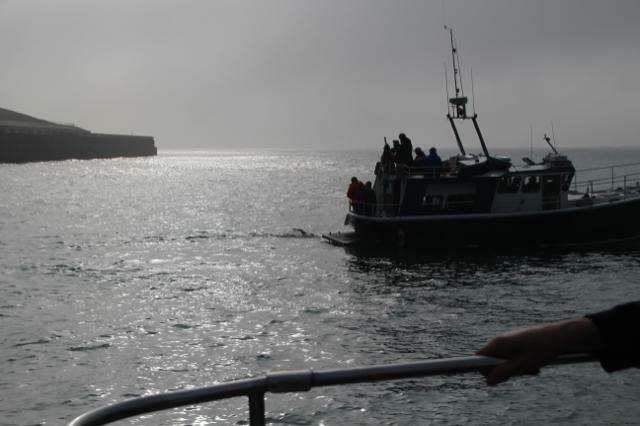 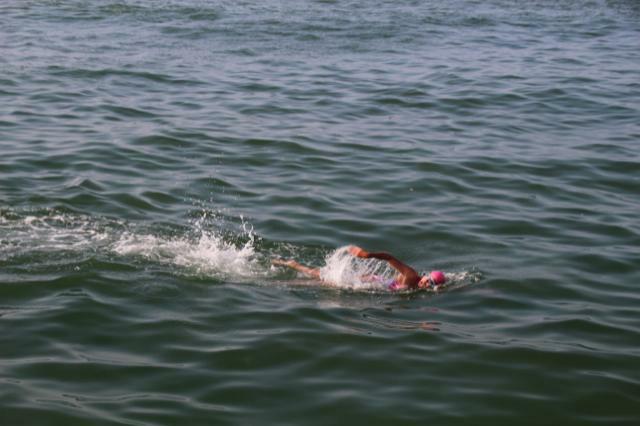 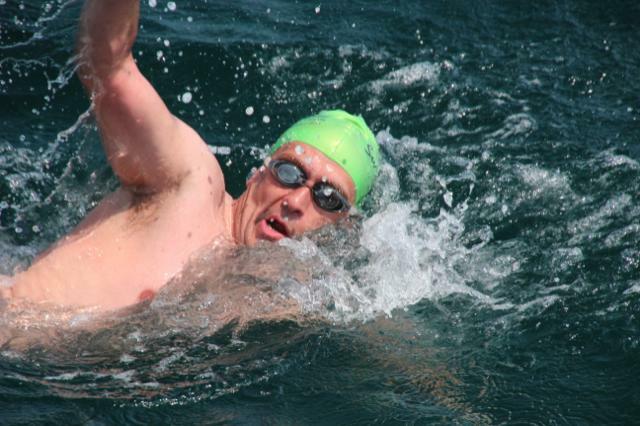 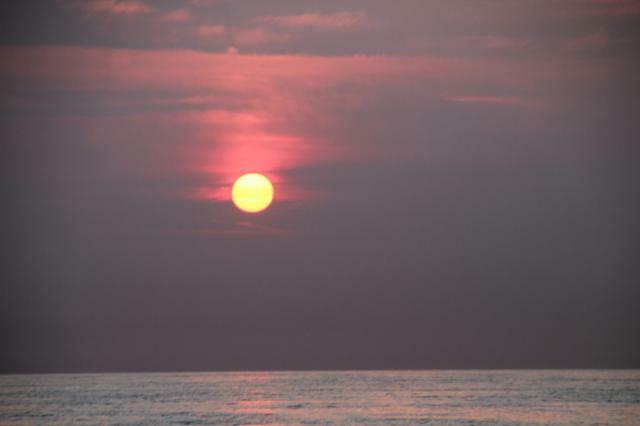 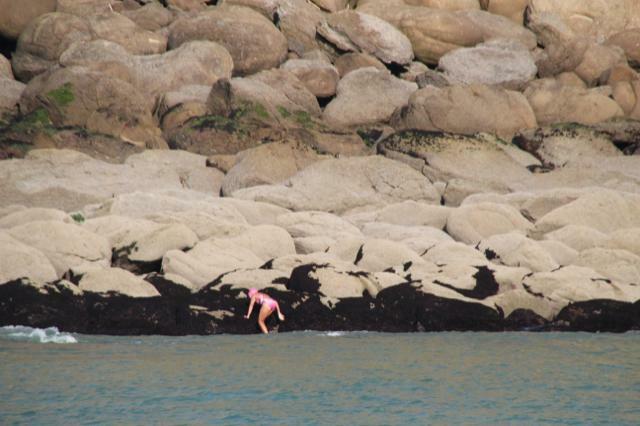 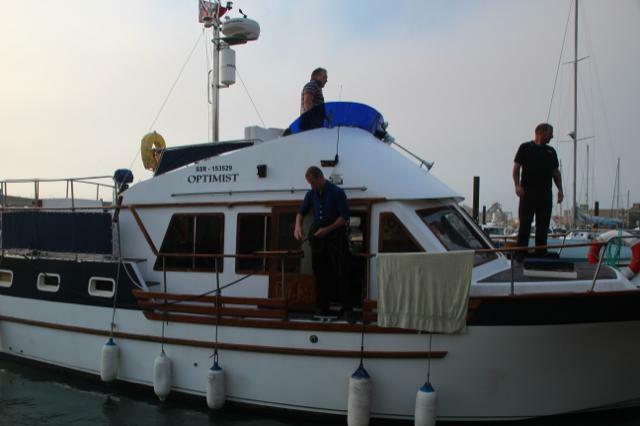 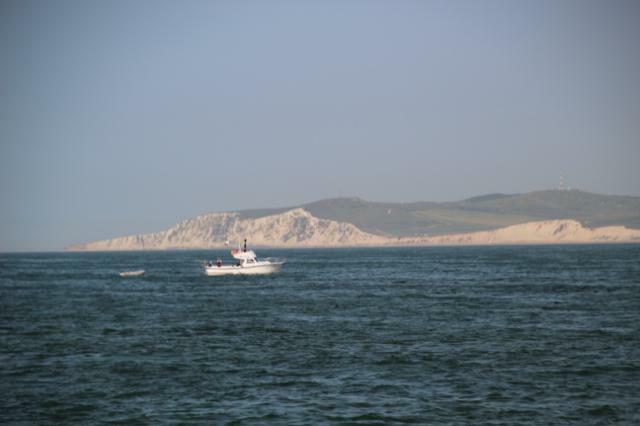 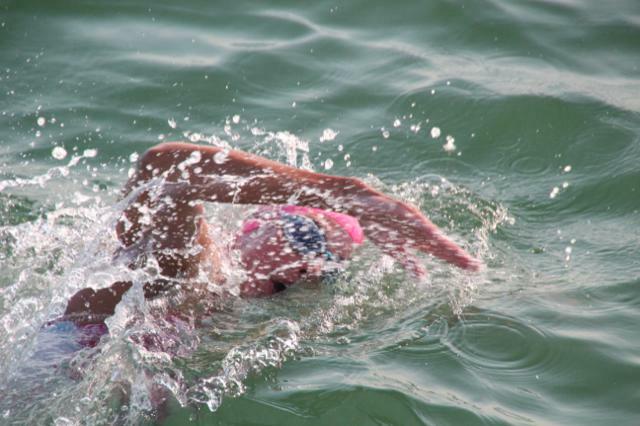 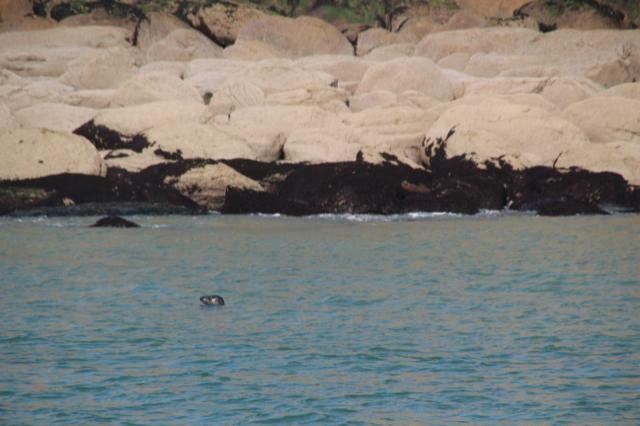 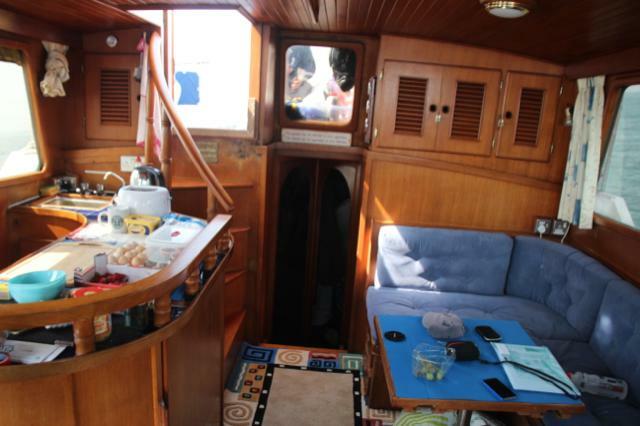 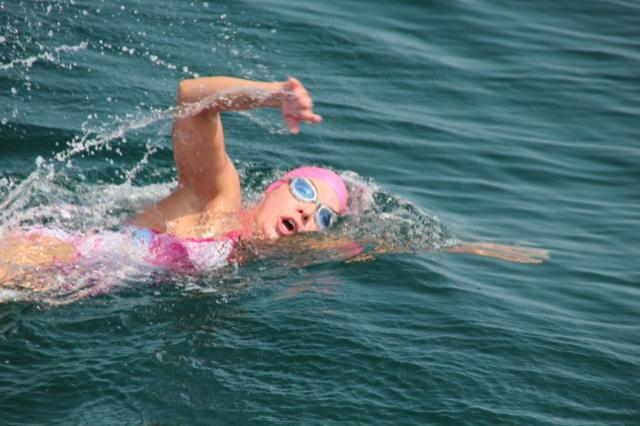 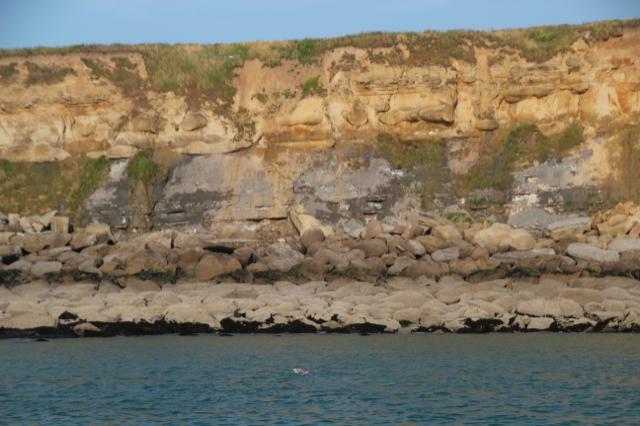 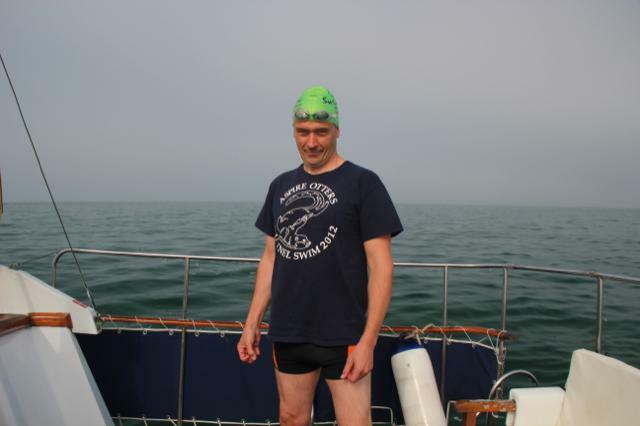 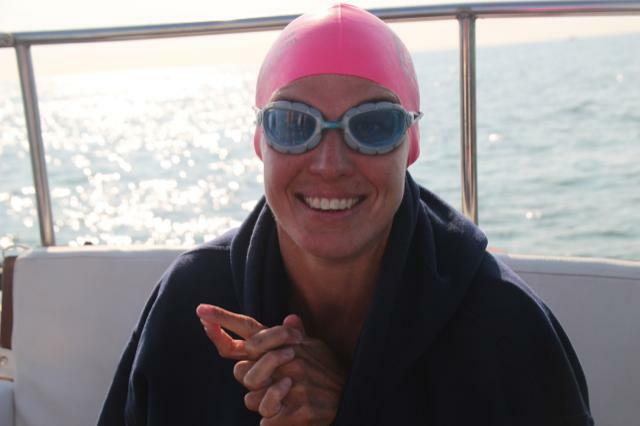 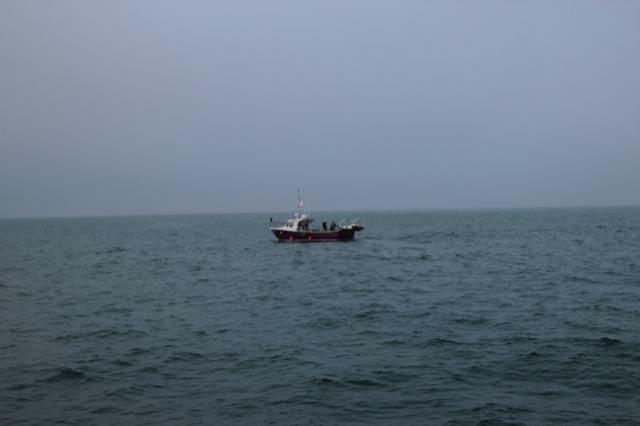 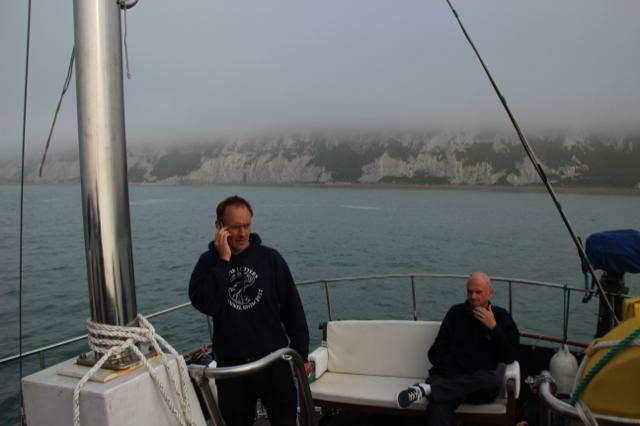 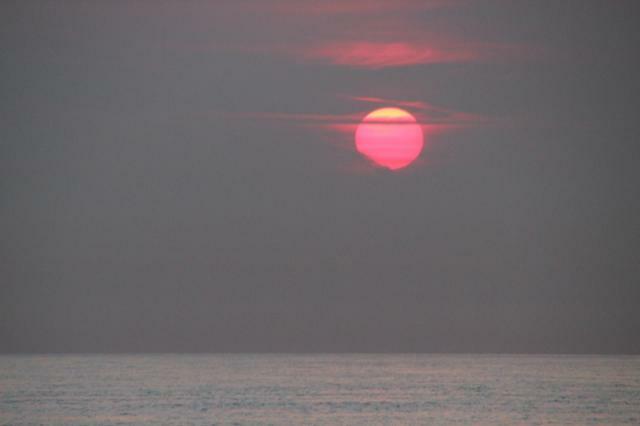 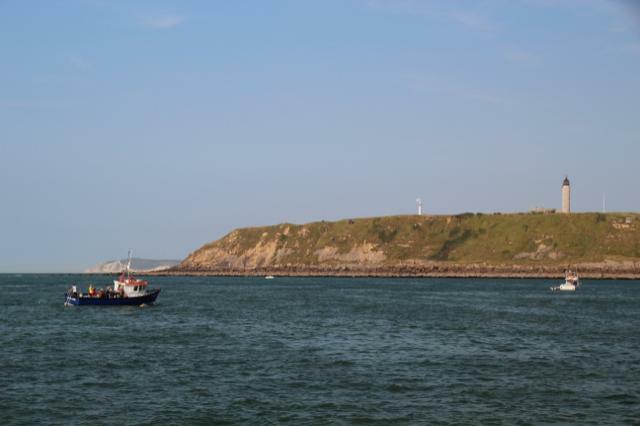 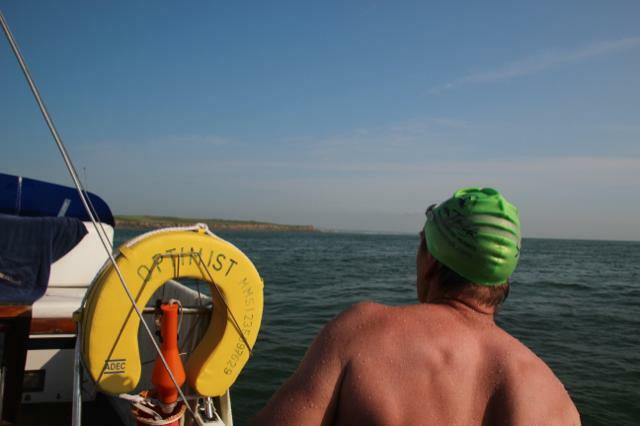 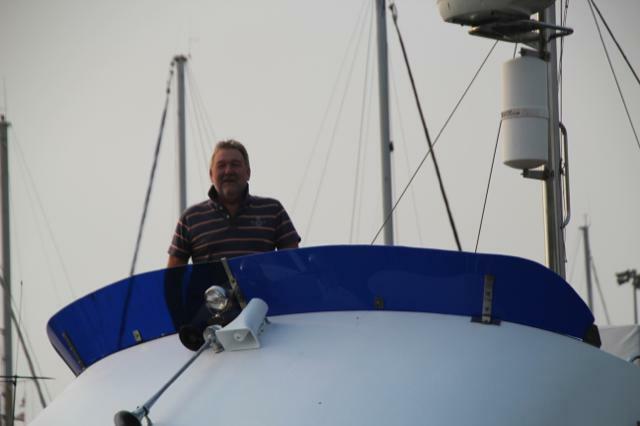 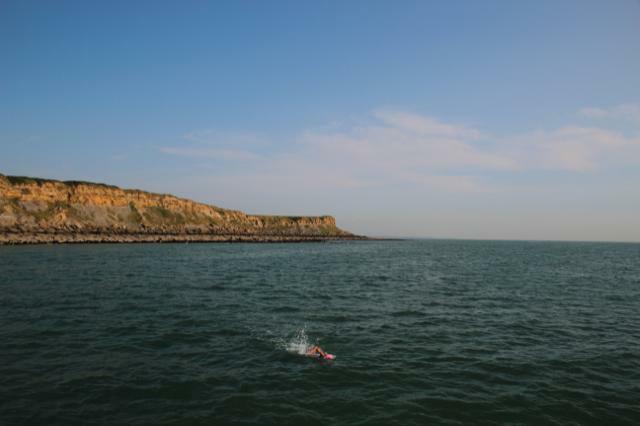 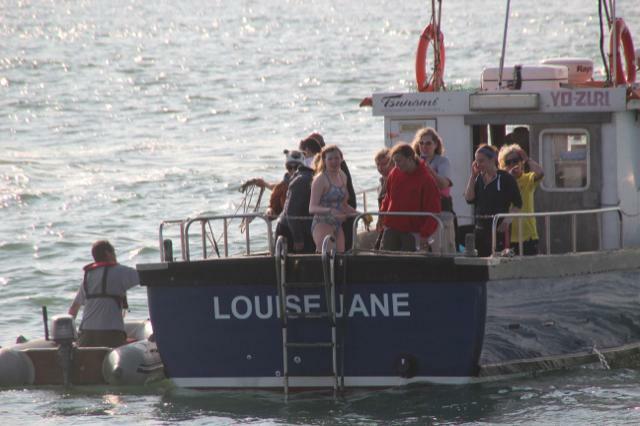 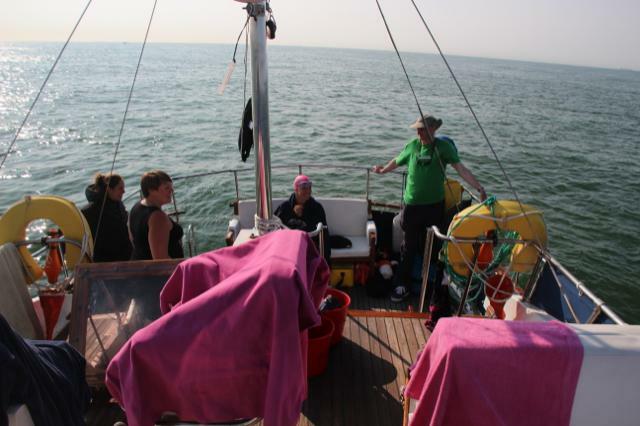 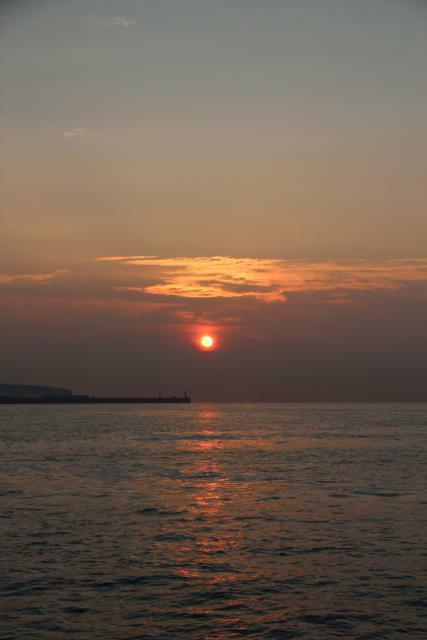 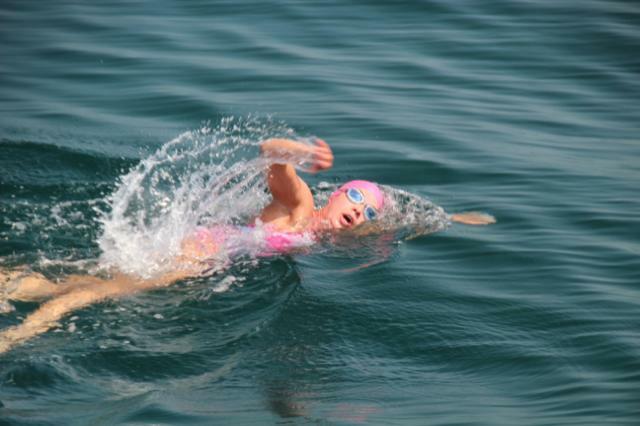 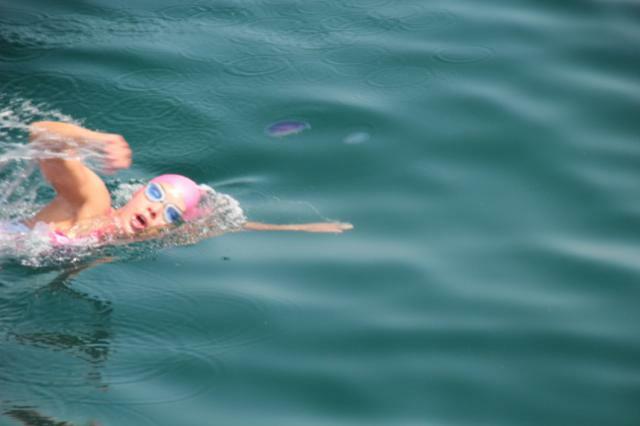 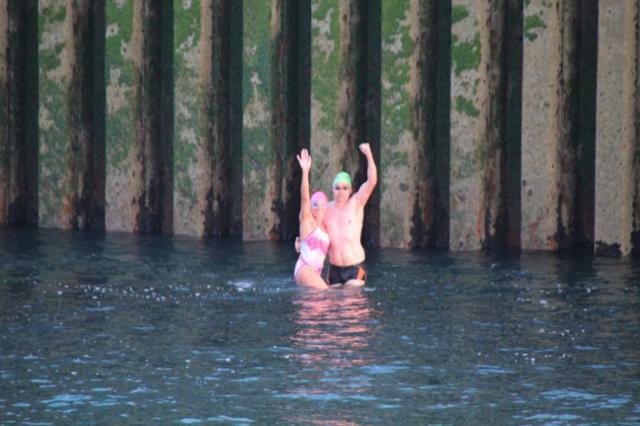 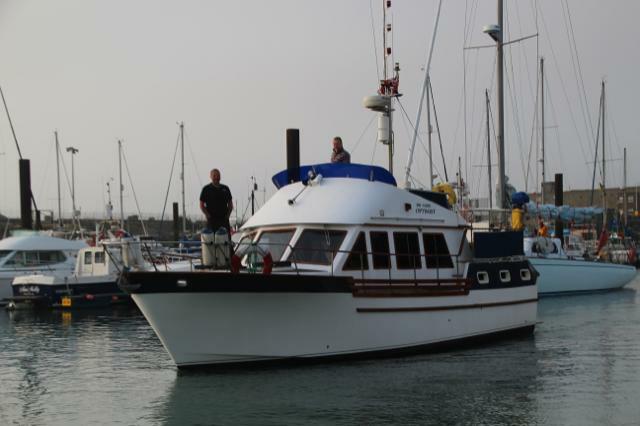 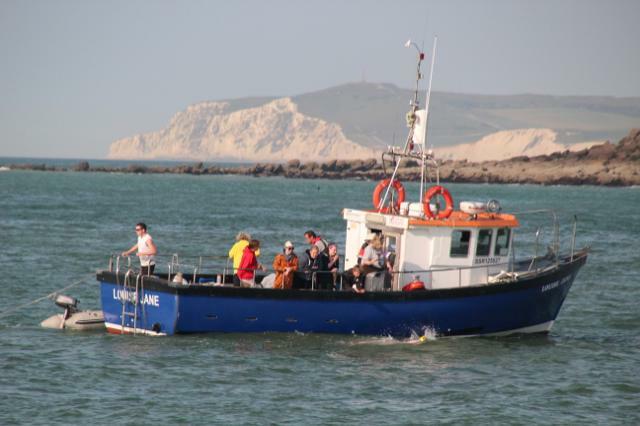 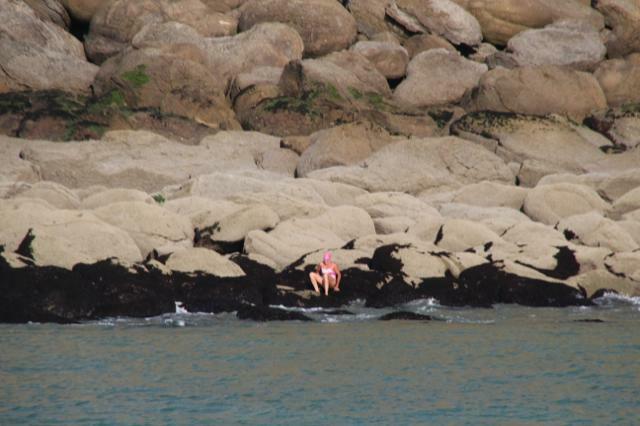 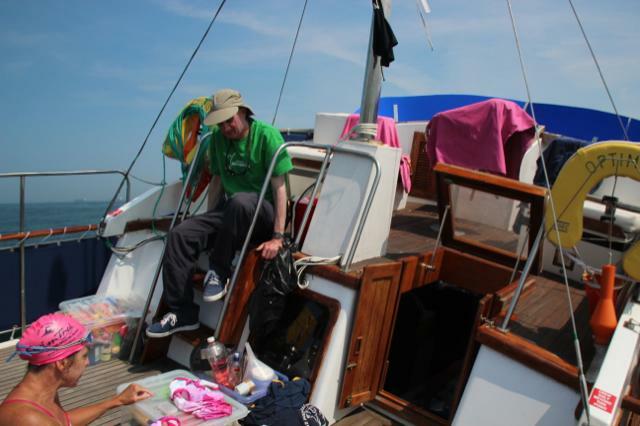 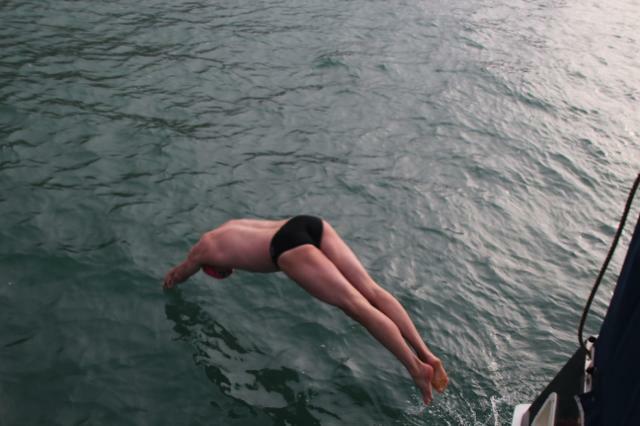 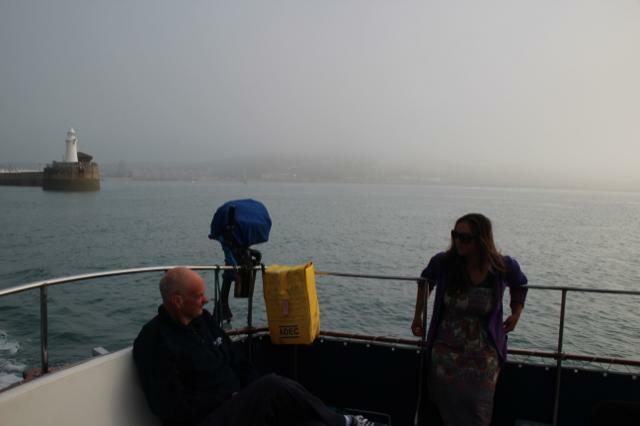 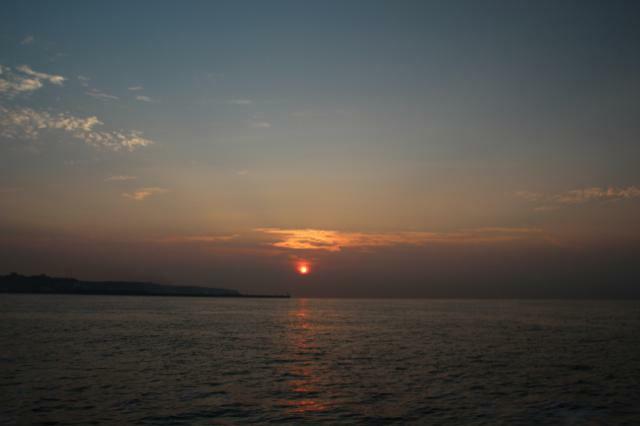 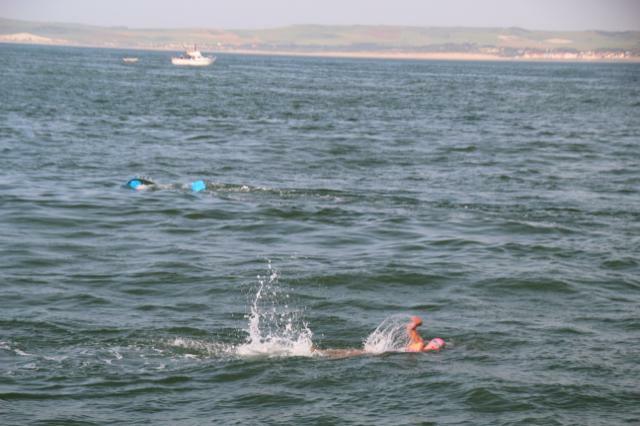 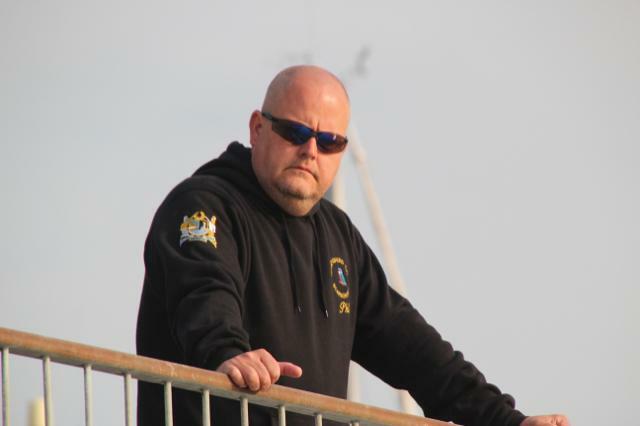 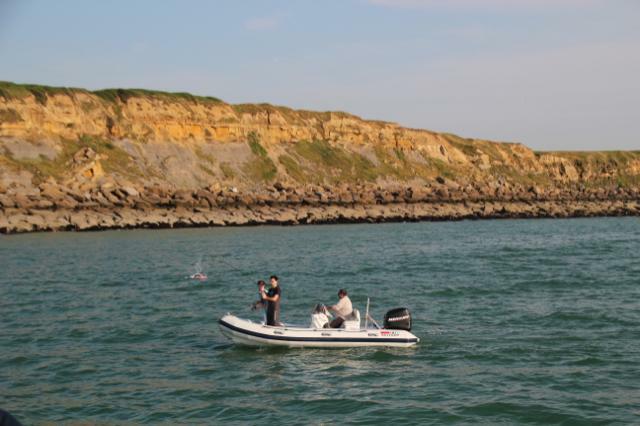 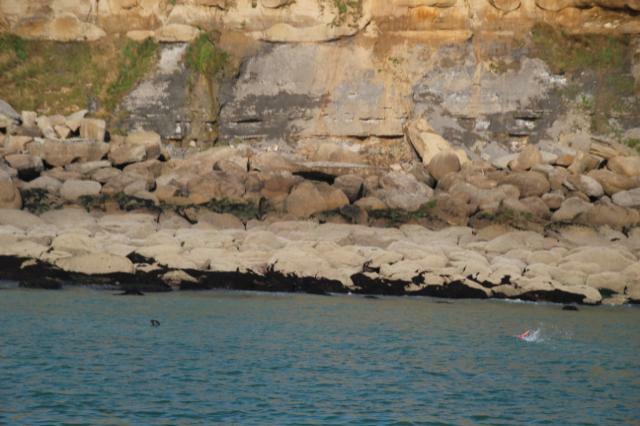 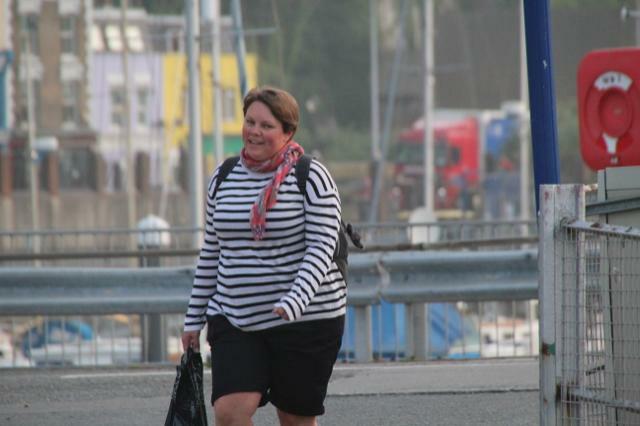 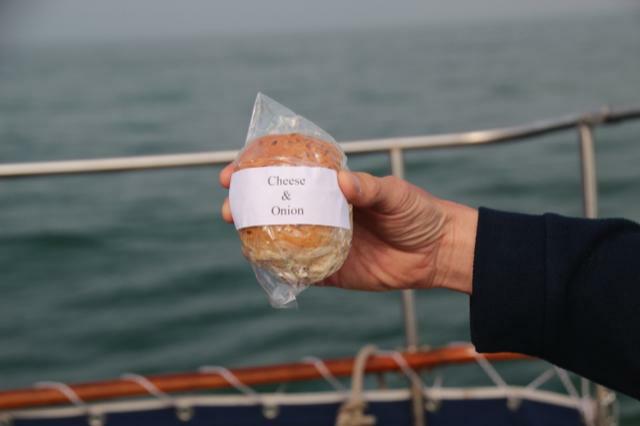 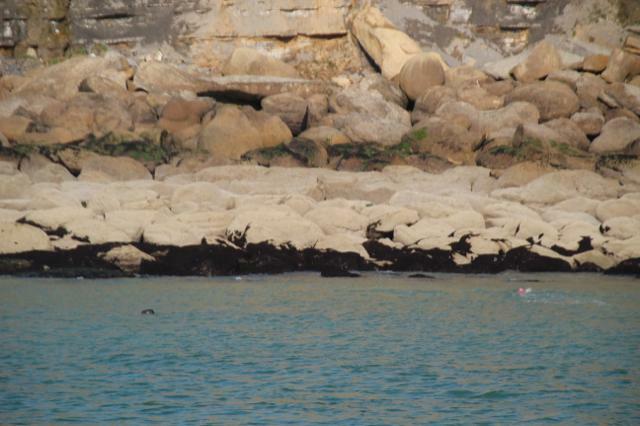 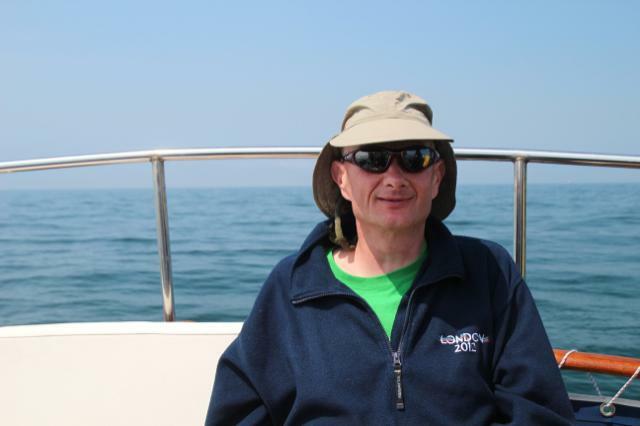 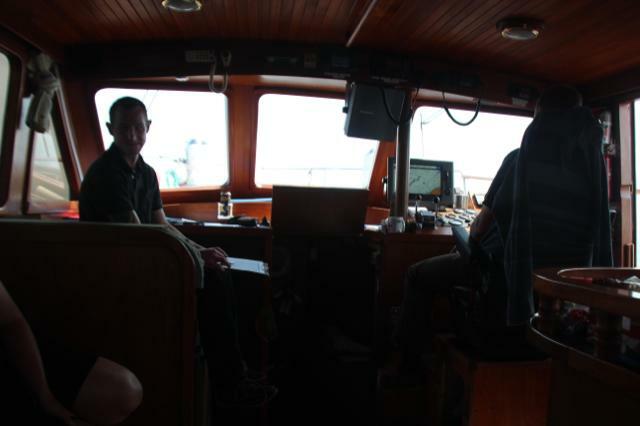 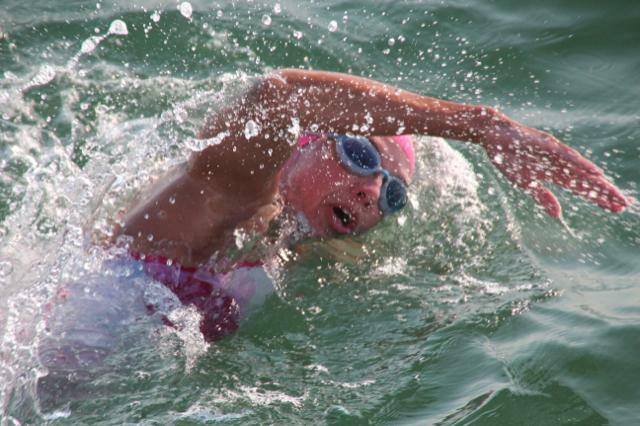 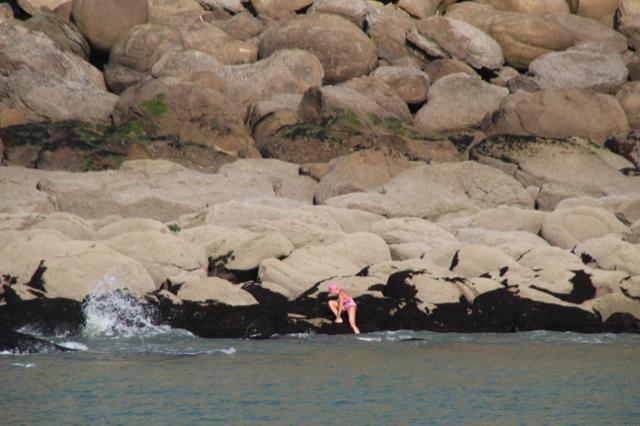 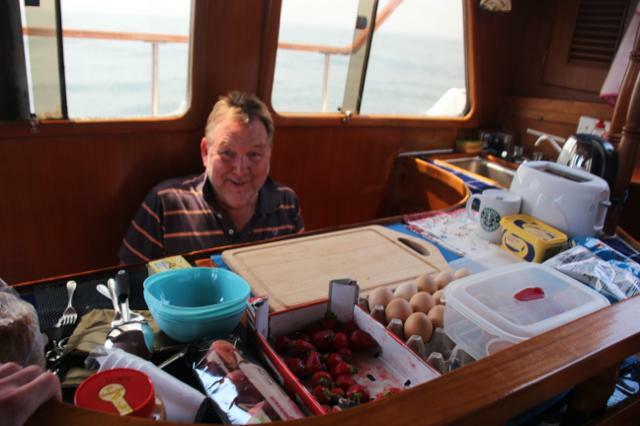 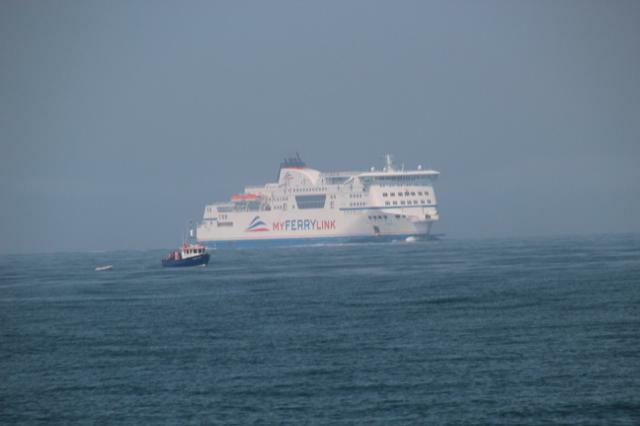 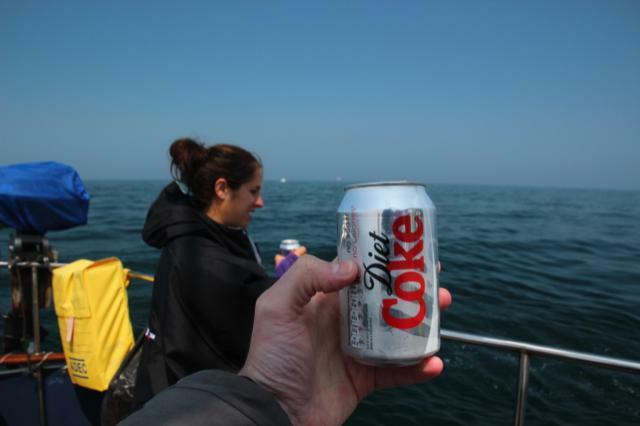 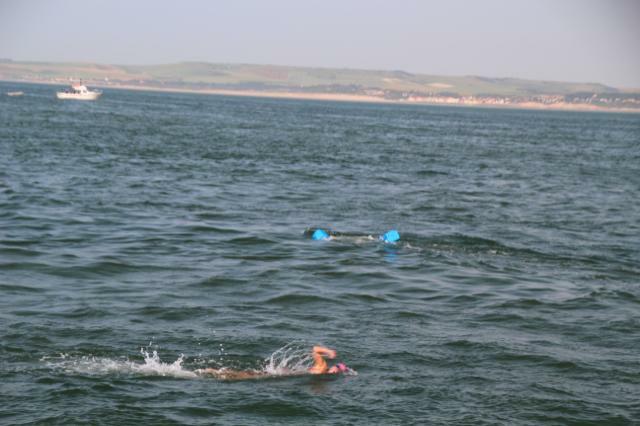 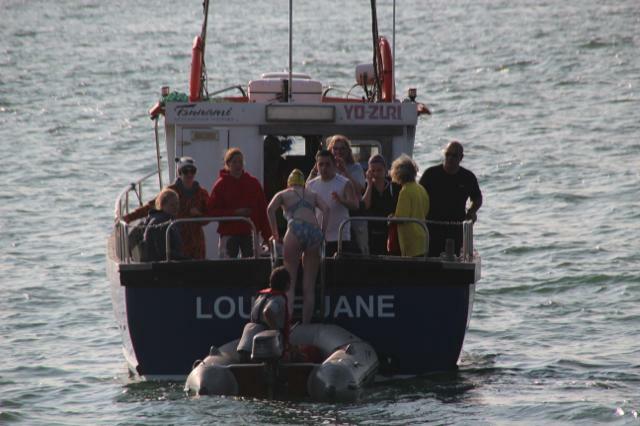 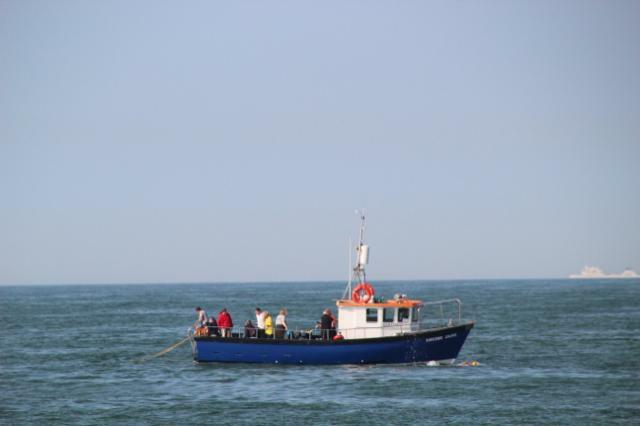 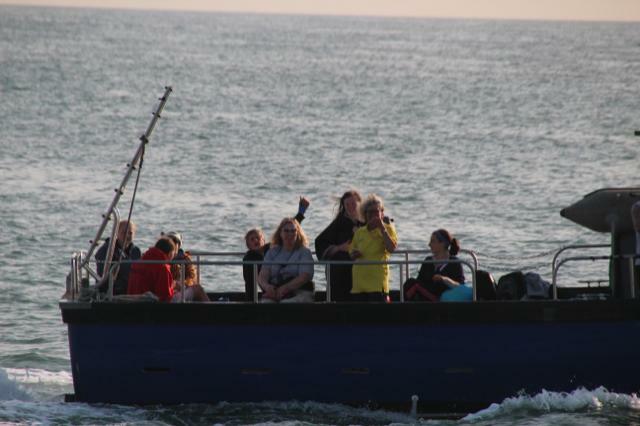 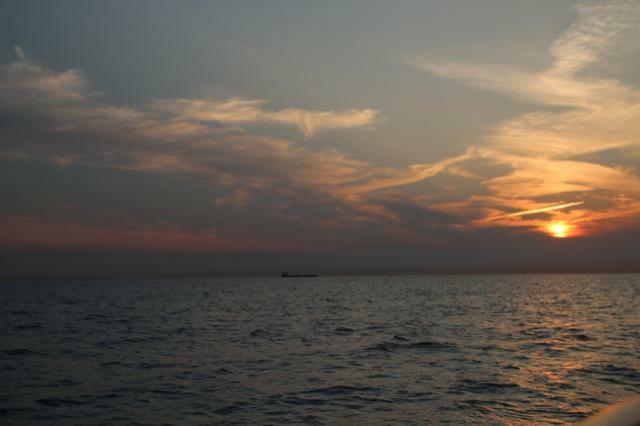 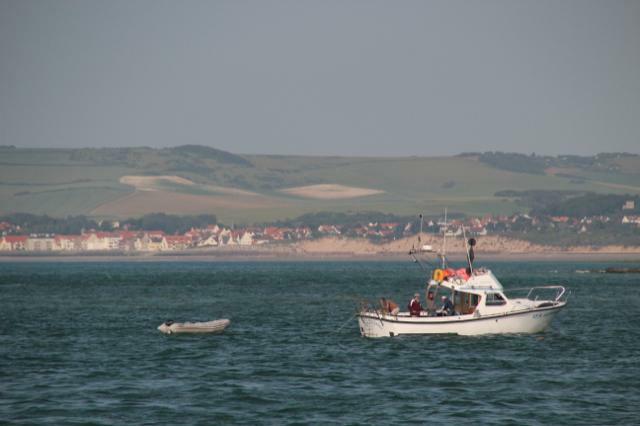 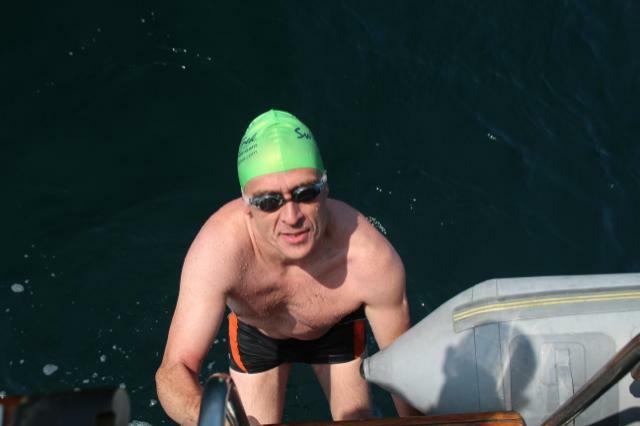 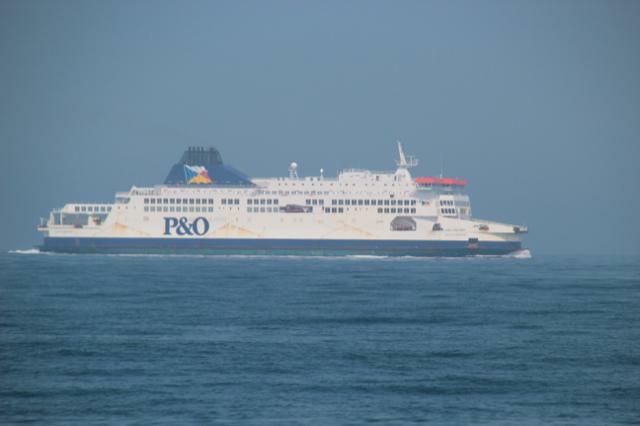 Paul Foreman steered the Optimist to perfection, and Regina swam us onto Cap Gris Nez 10 hours and 33 minutes later. 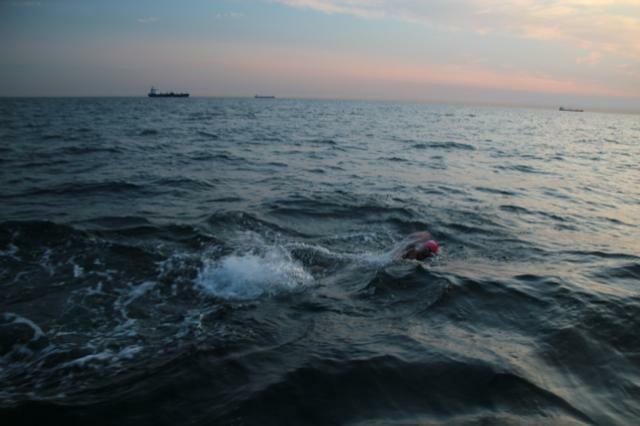 This was a great first leg, and ordinarily would have been a cause for celebration, however the biggest challenges now lay ahead. 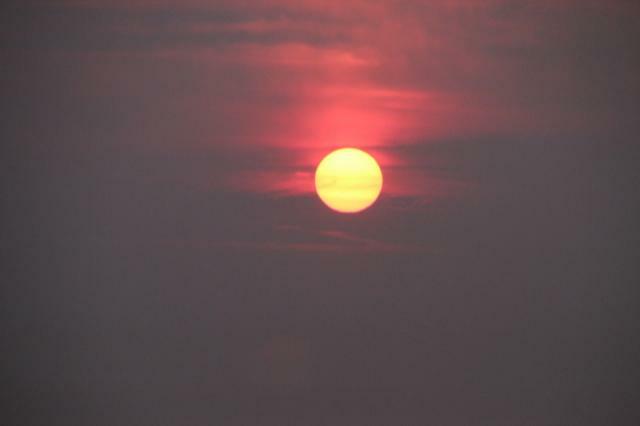 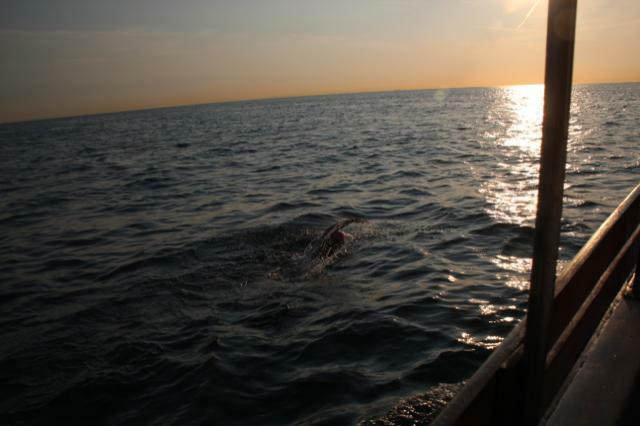 Three hours later darkness descended, and the night swimming began. 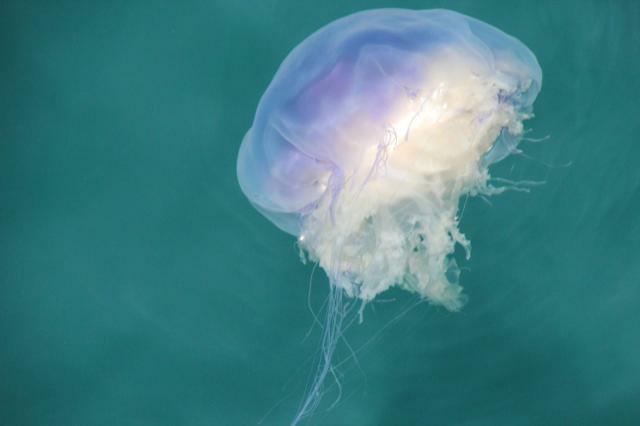 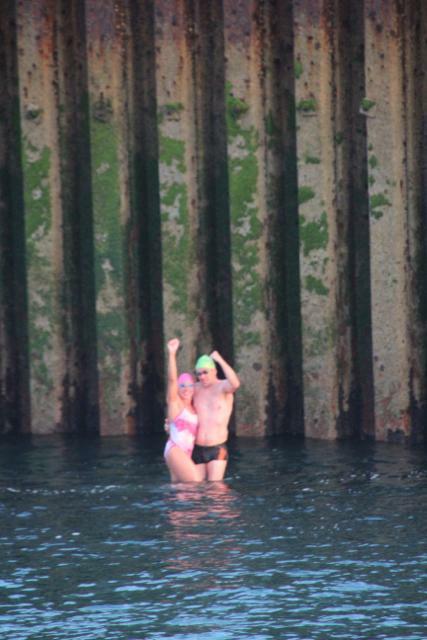 This meant gritting our teeth to make our way through fields of now-invisible jellyfish, overcoming fits of post-swim shivering to get our bodies back up to temperature in time for our next swims, all the time dealing with the accumulating fatigue of four, then five, cold immersions. 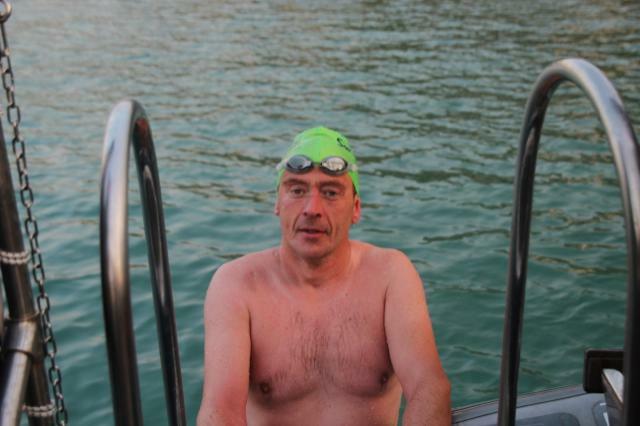 To those of us unused to night swimming this pushed us to physical and mental extremes we had never encountered before. 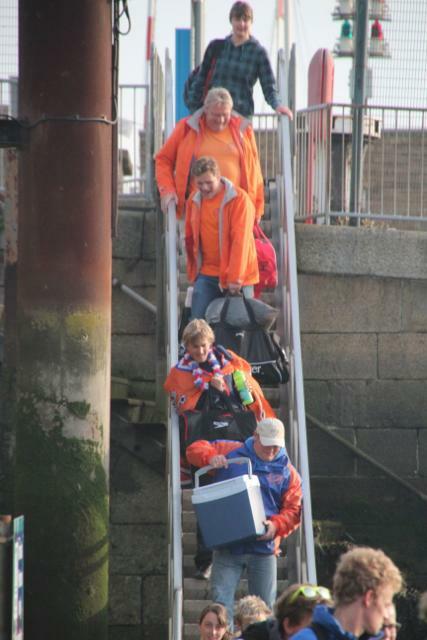 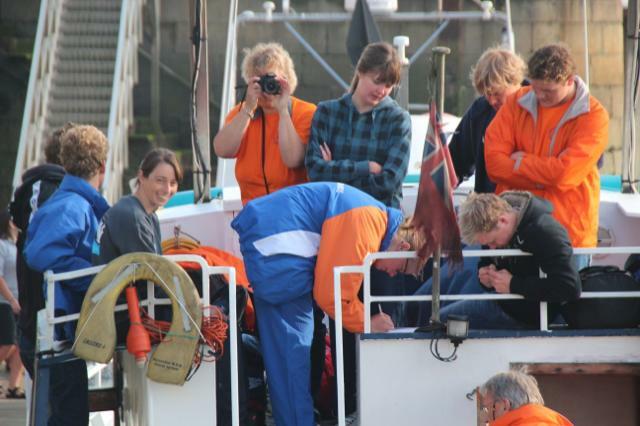 As everyone focussed inwardly and dug deep into their reserves, the news reached us that the conditions had proved too challenging for the Dutch team, and they had aborted their relay 12 miles from home. 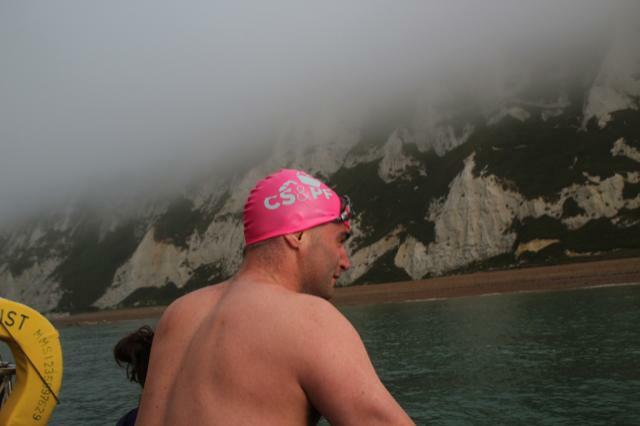 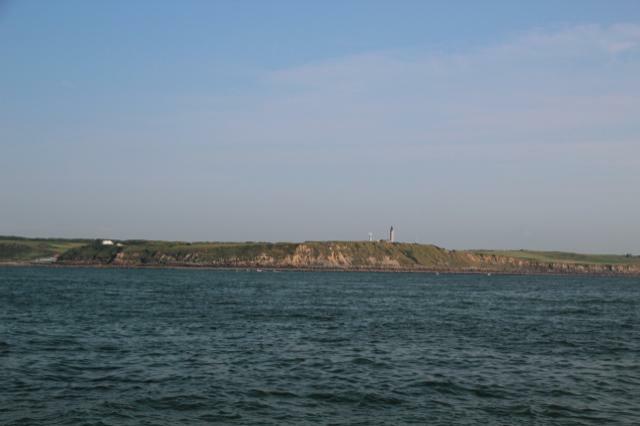 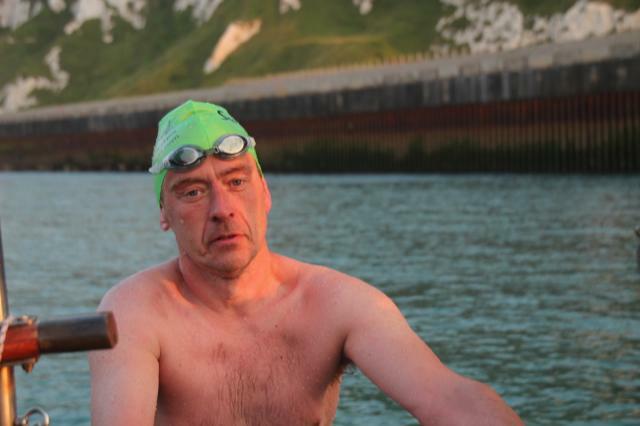 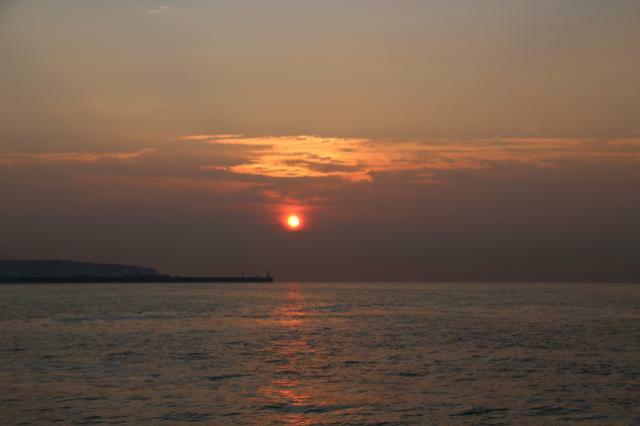 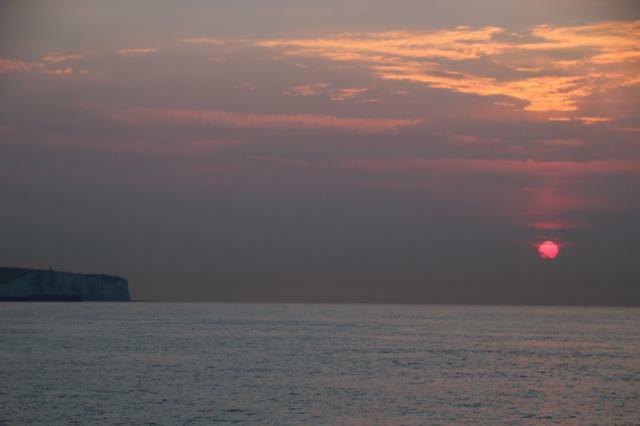 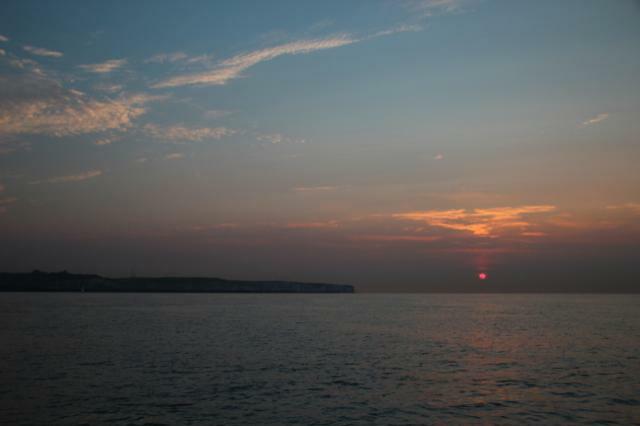 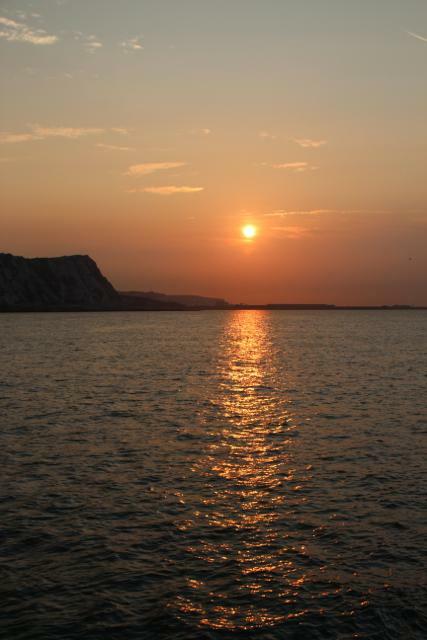 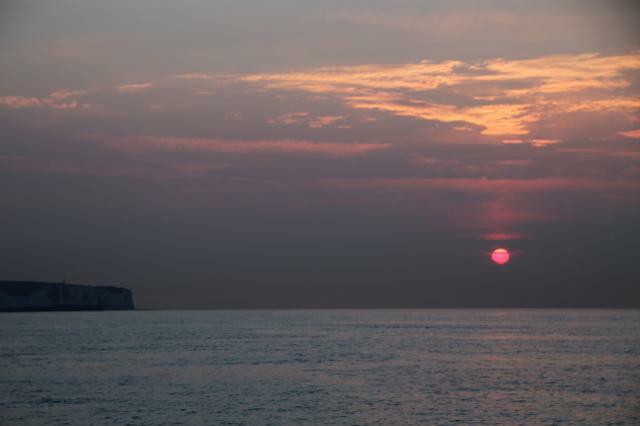 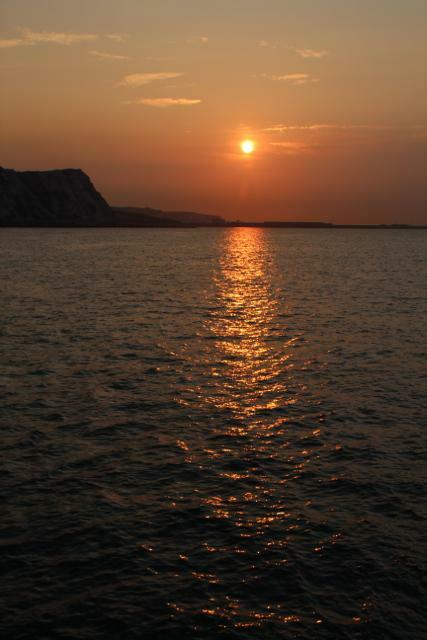 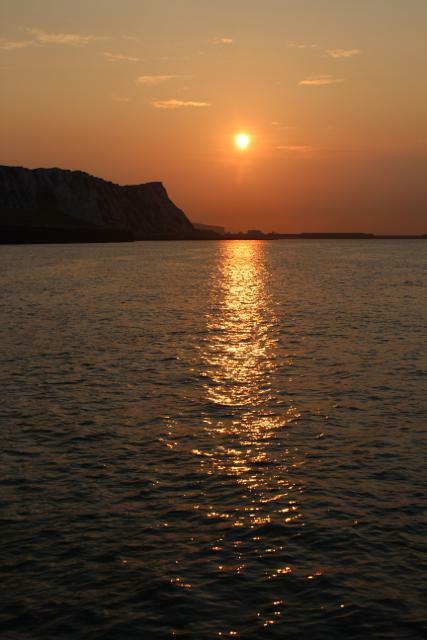 But we made it through the night, and as daylight revealed the cliffs of Dover some 5 miles in the distance and provided just a hint of extra warmth in the water, we could sense victory. 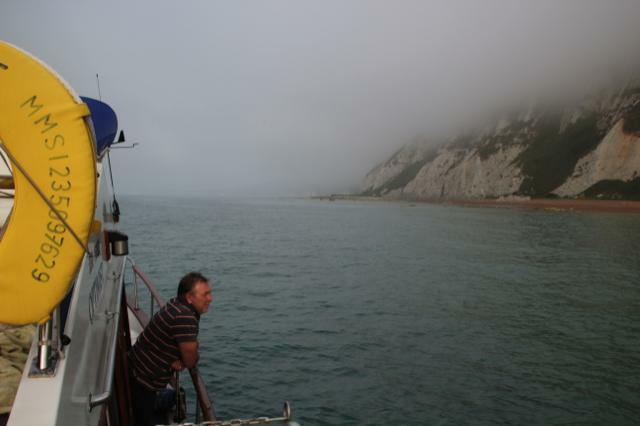 The tide, however, had other plans, and Paul warned us that we would need to give it our all for the next two hours to avoid being swept westwards along the English coast. 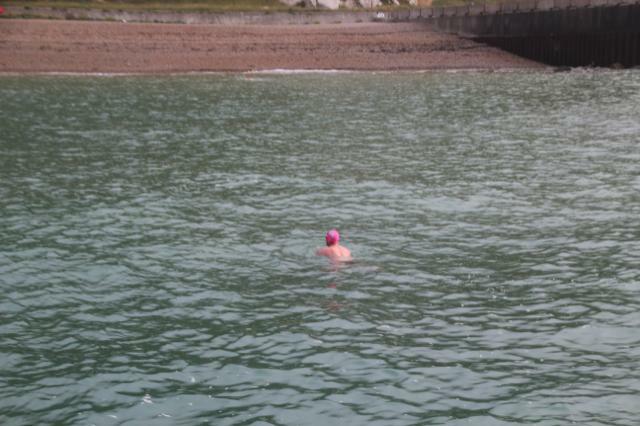 Nick duly entered the water and set out at a cracking rate while Grant stuffed down crumpets, tea and cake in a bid to maximise fuel for a final sprint. 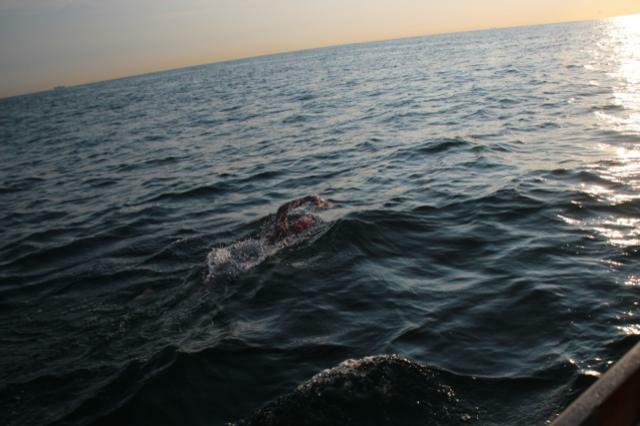 Somehow we held our line, and towards the end of Grant’s swim, Regina jumped in the water and swam him into shore to make land at 5.42am, to whoops of joy from both water and boat. 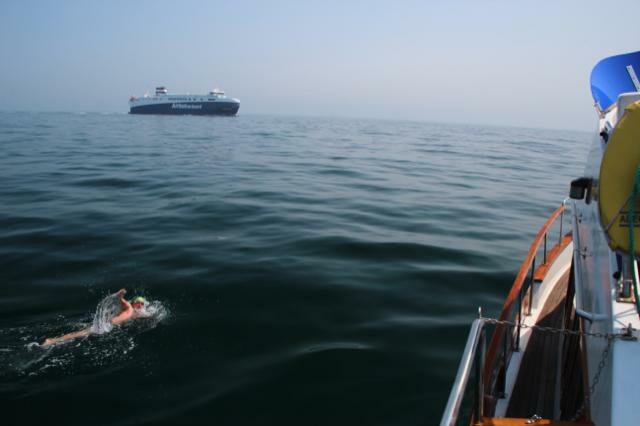 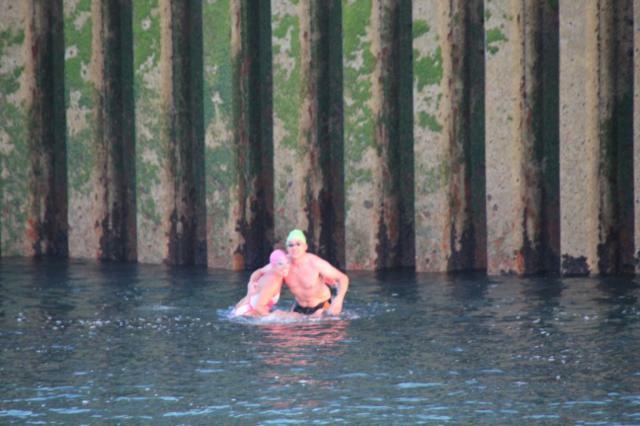 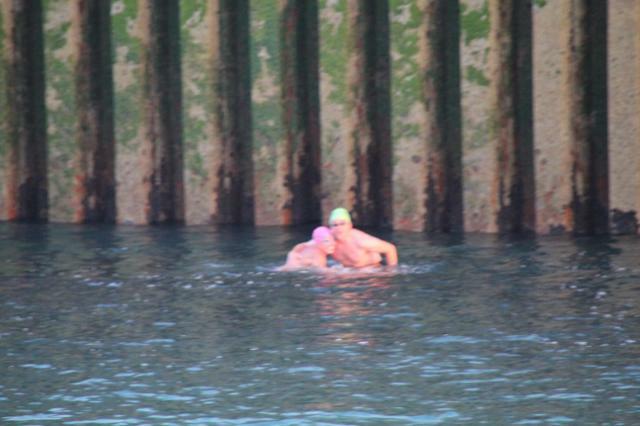 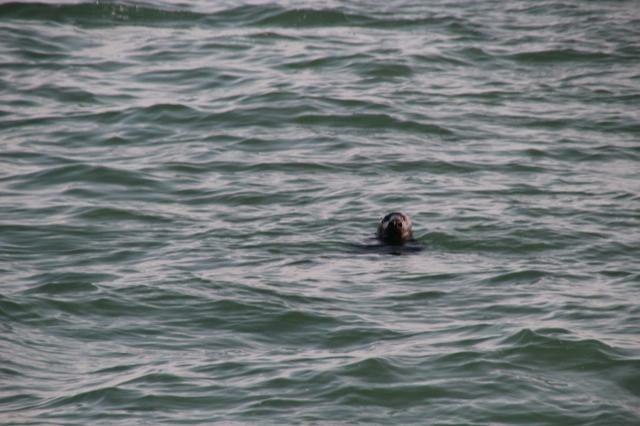 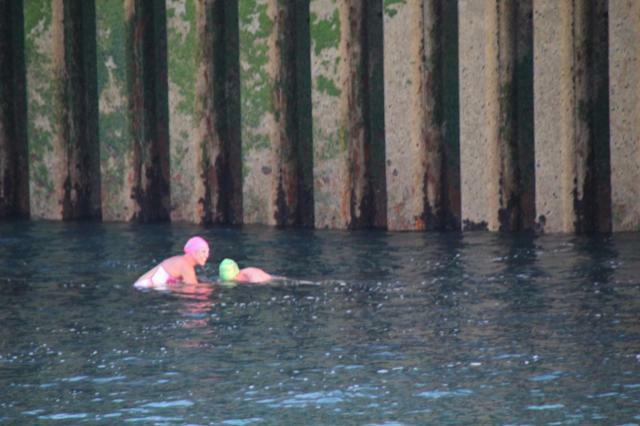 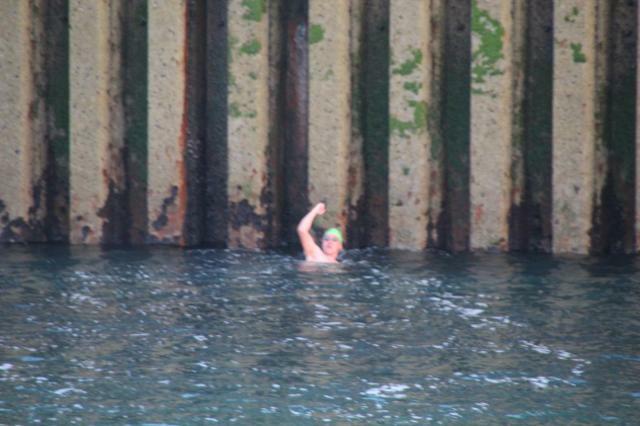 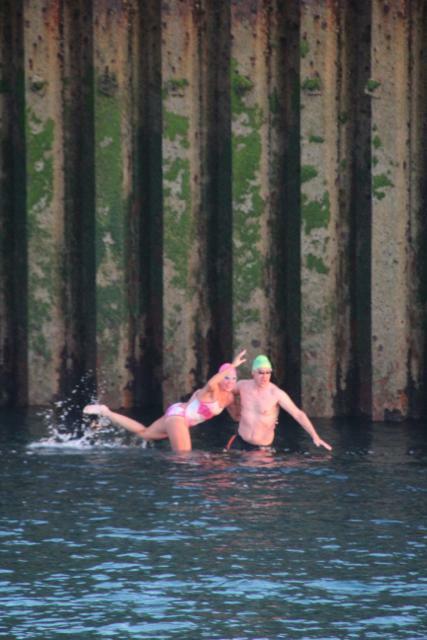 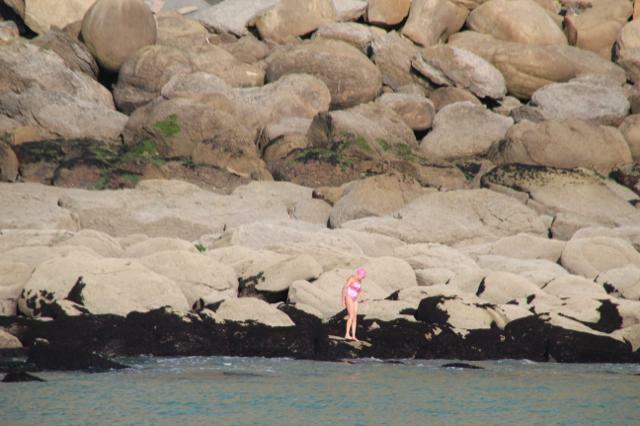 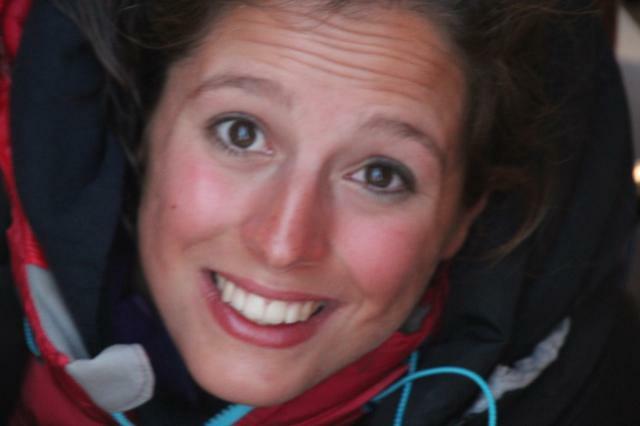 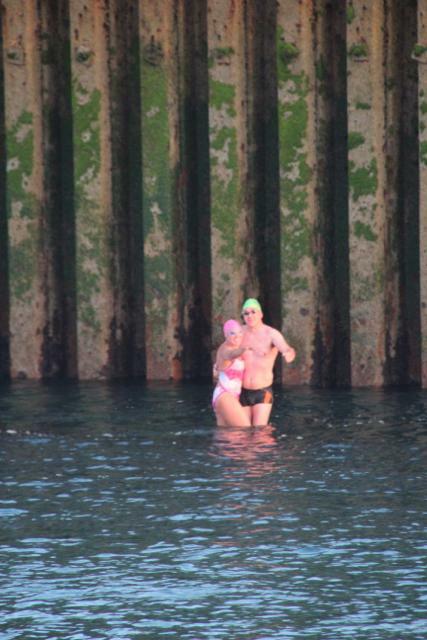 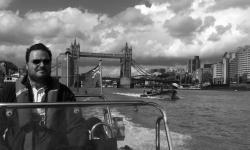 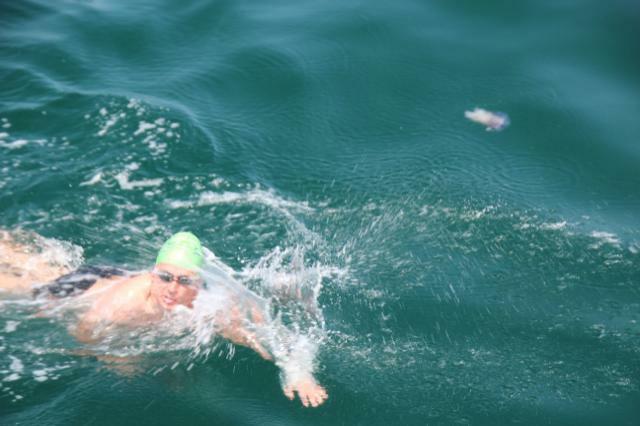 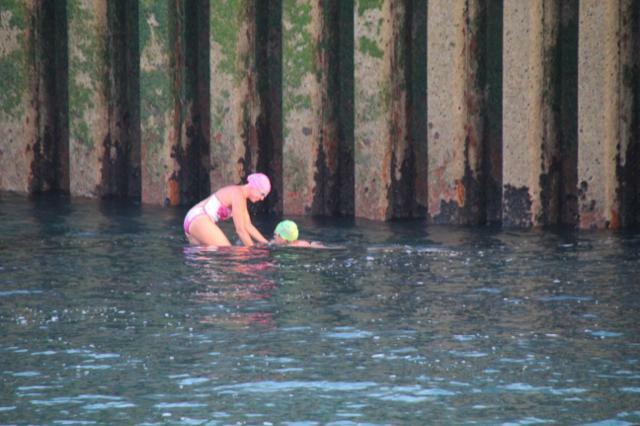 The return leg had been swum in 11 hours and 23 minutes, making a total 2-way time of 21 hours and 56 minutes. 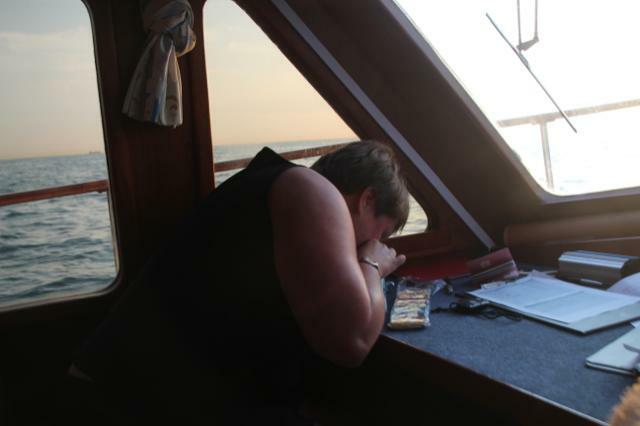 It only takes one slightly weak link to break a 22-piece chain. 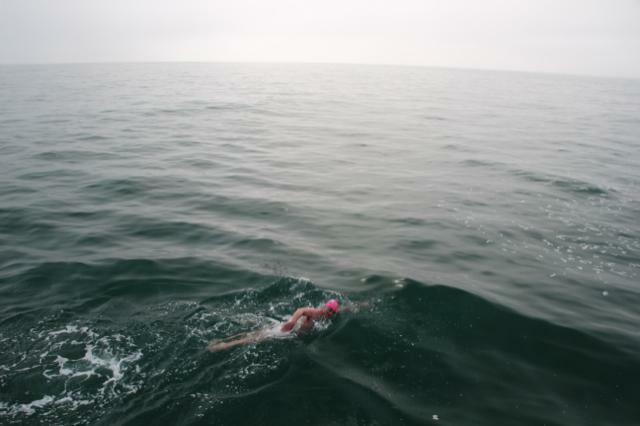 All four swimmers remained resolute and focussed throughout, and just got on with it quietly: if there were any doubts, they were not shared. 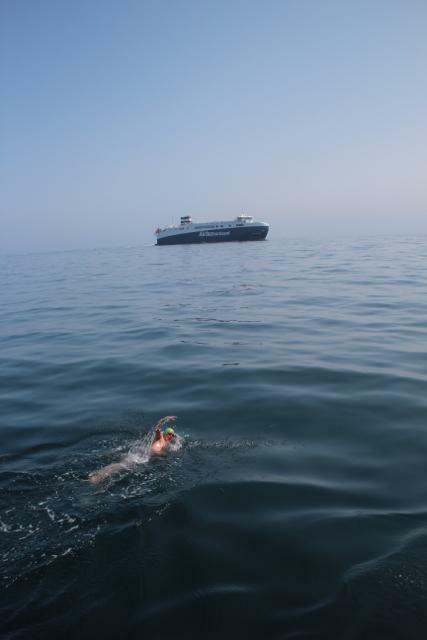 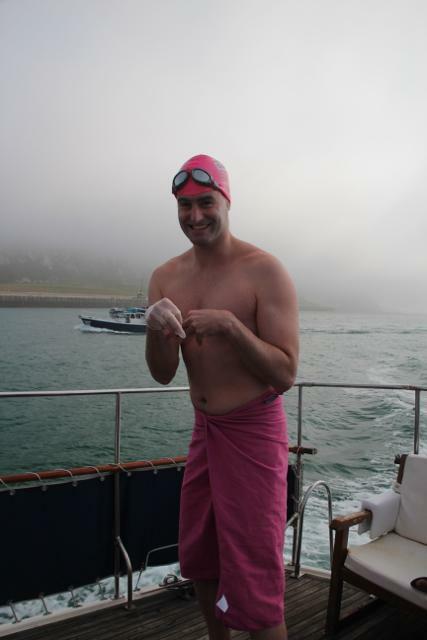 But there was a lot more to it than this: Andrew Ogierman from Aspire looked after us wonderfully throughout the swim; Paul and his crew of Ray, Sam and Michelle were incredibly supportive and kept the good humour and precious hot tea flowing. 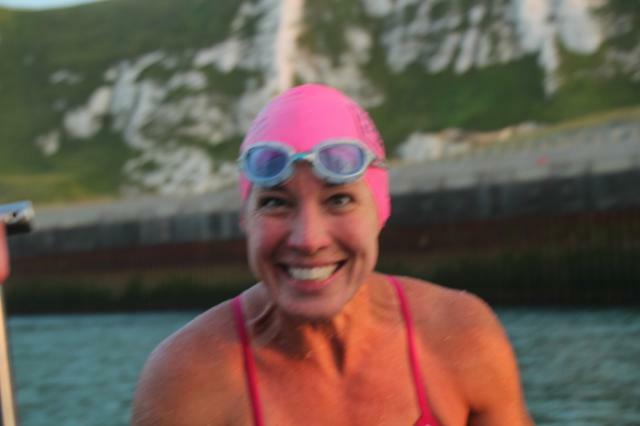 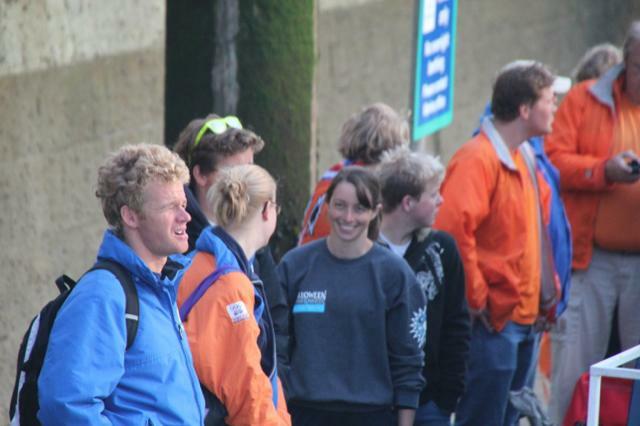 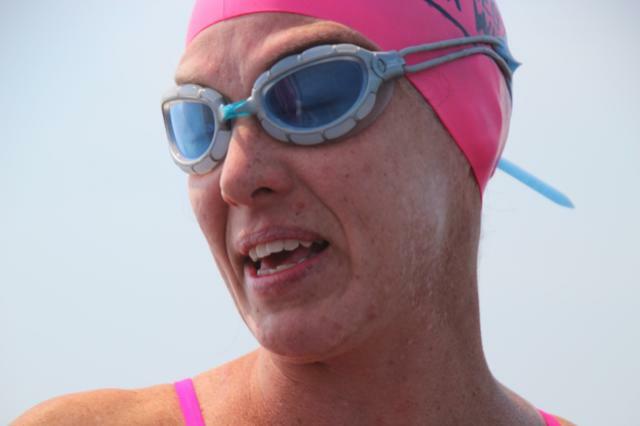 And friends, family, and the channel swimming community kept morale high with texts and tweets of encouragement. 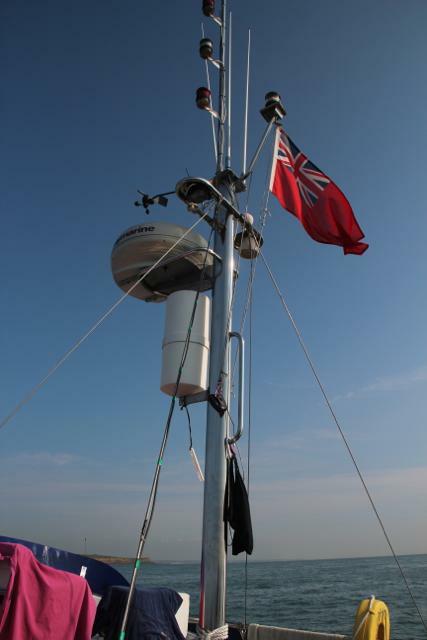 You need a lot of planets to align to get a channel relay away successfully and on this day, magically, they did. 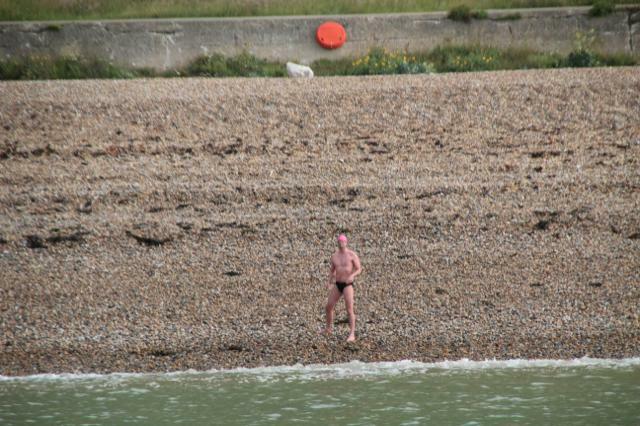 One day later, Andy Murray won Wimbledon. 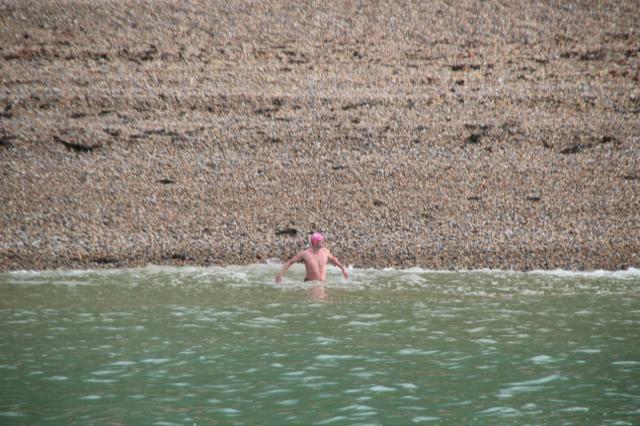 And we knew exactly how he felt.